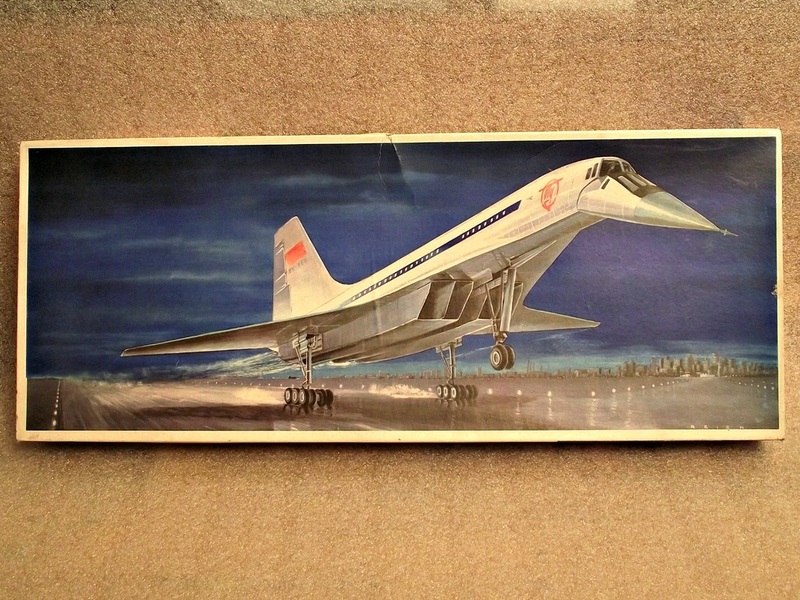 The name VEB Plasticart should be read something like "Company Plasticart". To be more accurate VEB Plasticart means "Volkseigener Betrieb Plasticart" where VEB was a communist era designation meaning "People (read State) owned enterprise"
The scale model was made in the late 1970's by east German manufacturer VEB Kombinat PLASTICART Plastspielwaren at a scale 1:50. The pictured model was assembled in the early 1980's and the foto was taken in febr. 2013. The Antonov AN-2 is a single-engine biplane utility/agricultural aircraft designed in the USSR in 1946. 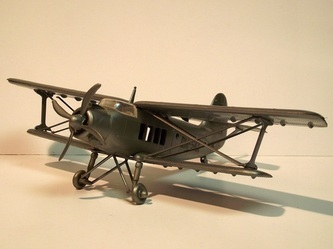 The AN-2 is used as a light utility transport, parachute drop aircraft, agricultural work and many other tasks suited to this large slow-flying biplane. 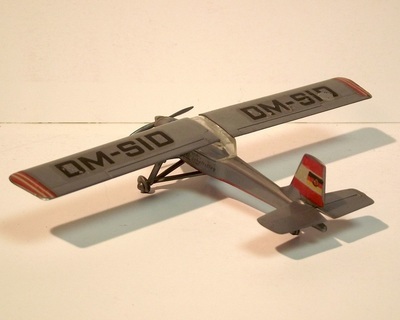 Its slow flight and good field performance make it suited for short, unimproved fields. 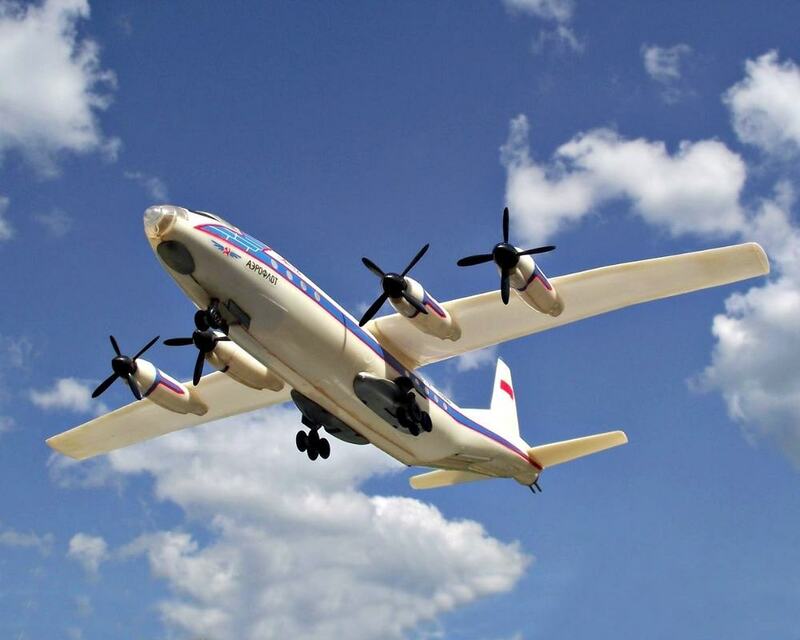 The Guinness Book of World Records states that the 45-year production run for the AN-2 was for a time the longest ever, for any aircraft, but it was recently exceeded by the Lockheed C-130 Hercules. 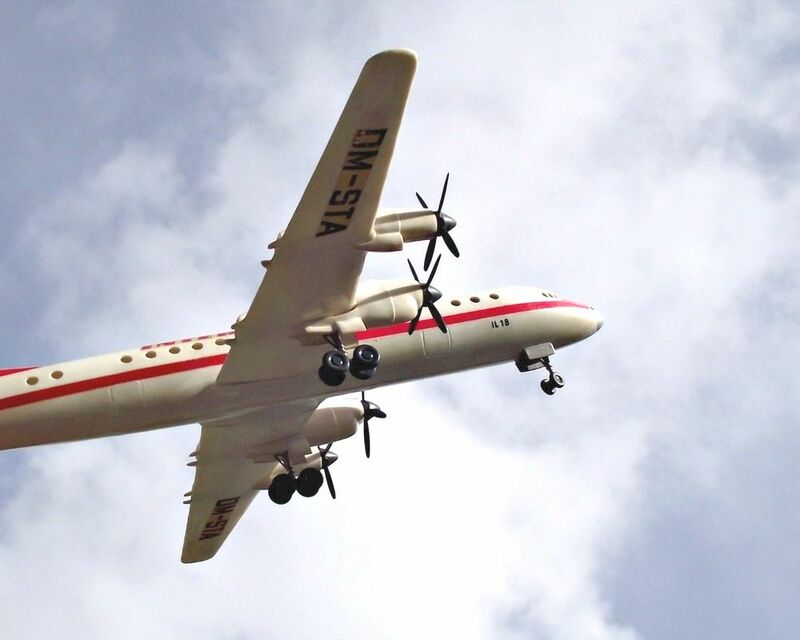 China also builds the AN-2 under license as the Shijiazhuang Y-5. 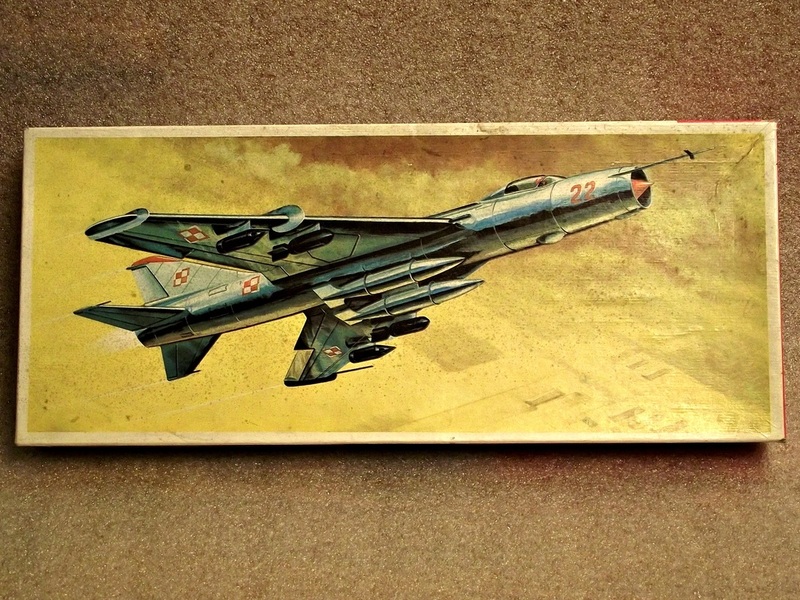 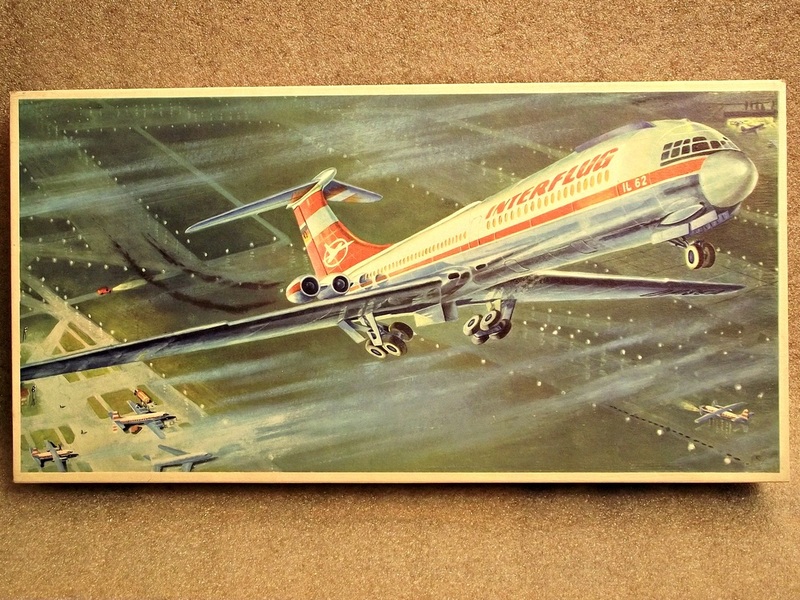 This plastic airplane model kit was made between 1962-1989 by east German manufacturer VEB Kombinat PLASTICART Plastspielwaren. 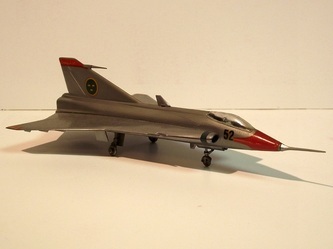 It is a 1:75 scale model. 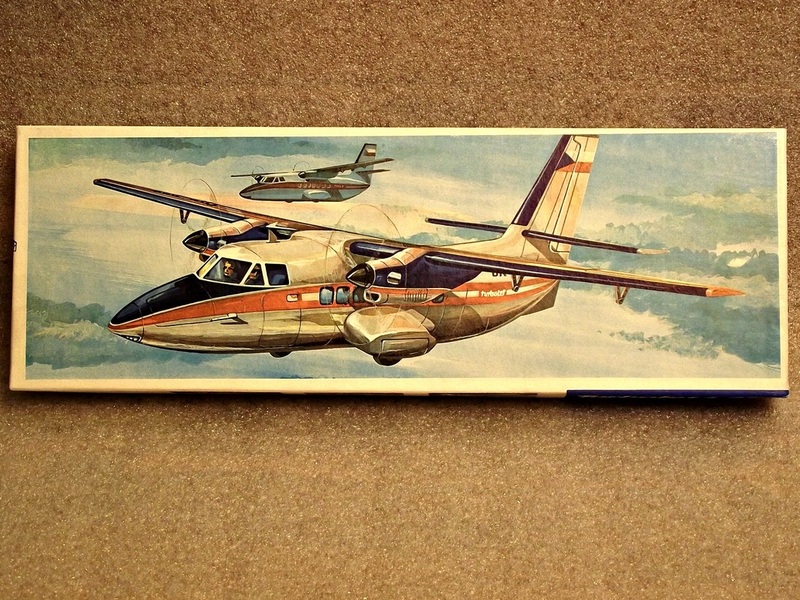 The decals on this aircraft are for a former east German civilian airplane. 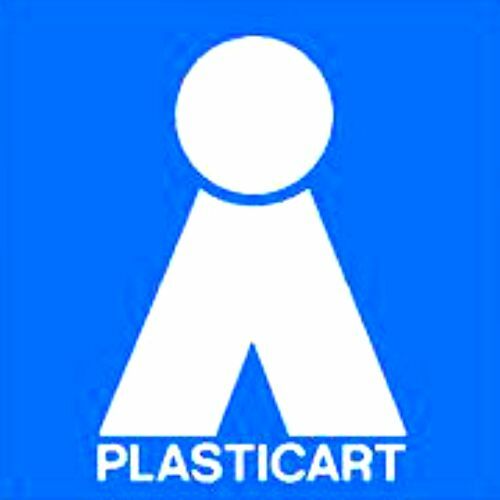 Plasticart. 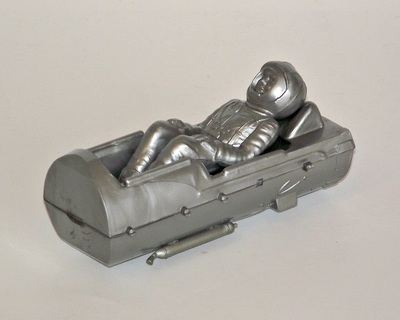 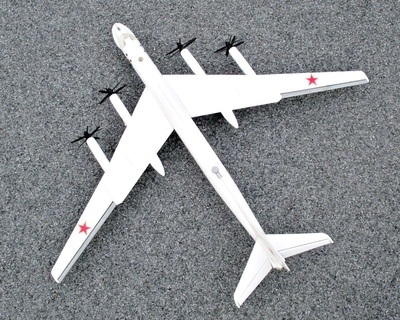 Molded in white, silver, black and clear including full landing gear and display stand. 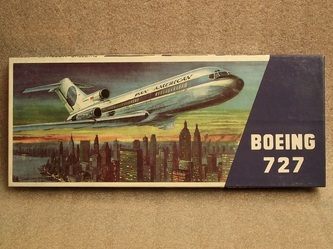 The BOEING 727 is a mid-size three-engine jet aircraft introduced in 1964. 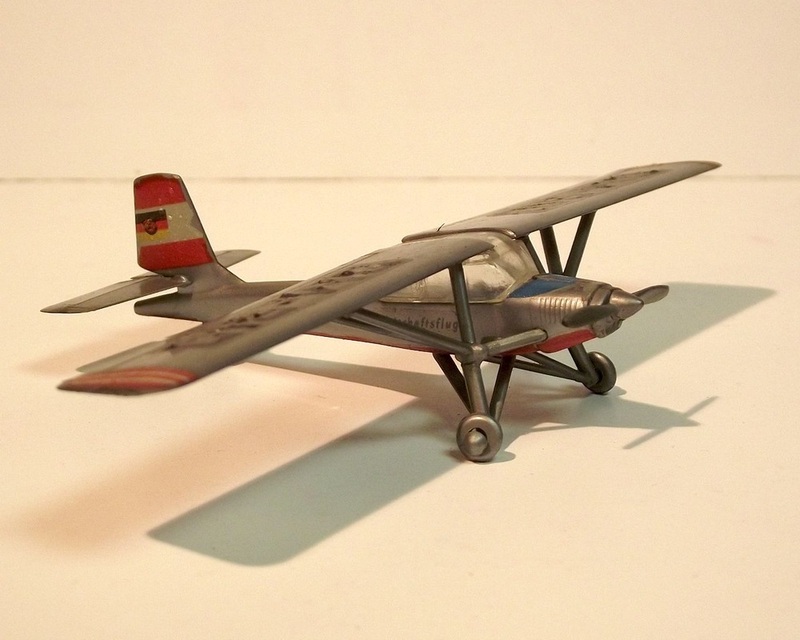 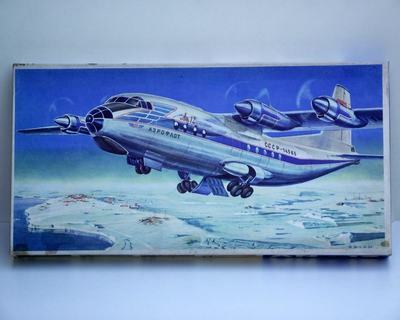 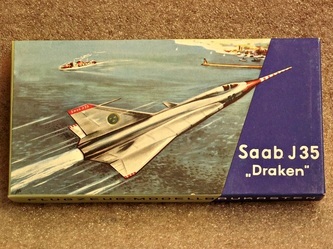 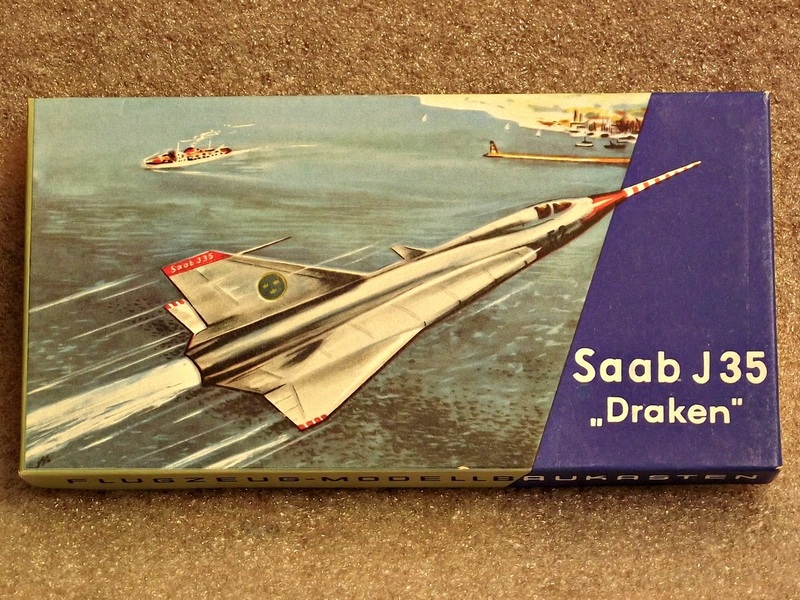 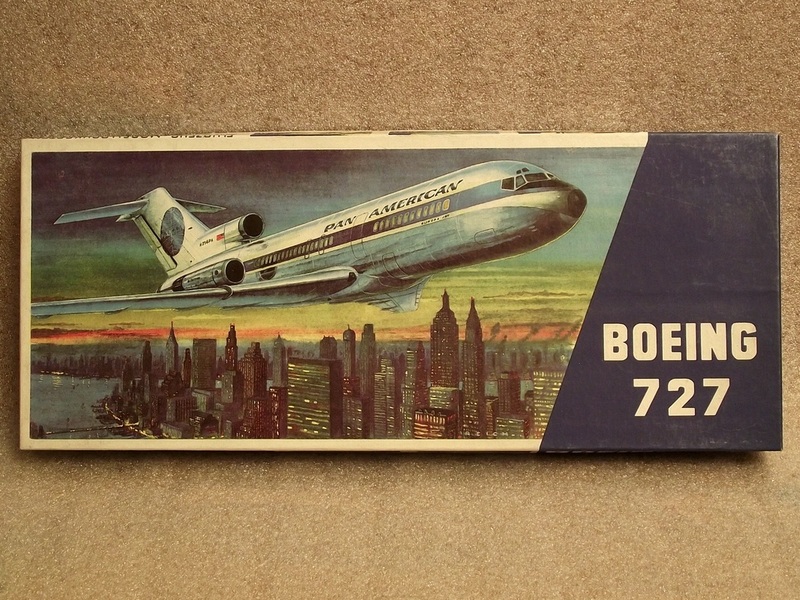 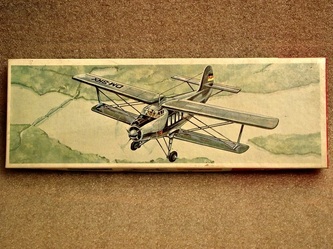 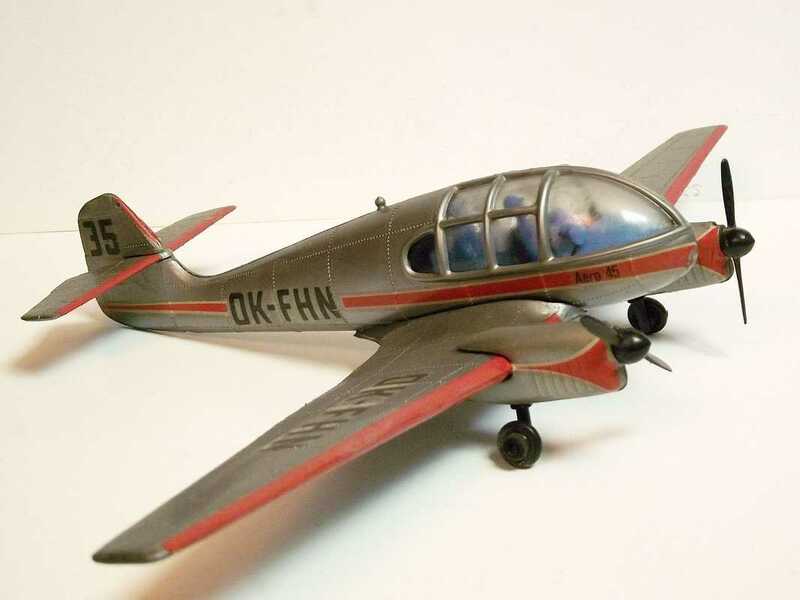 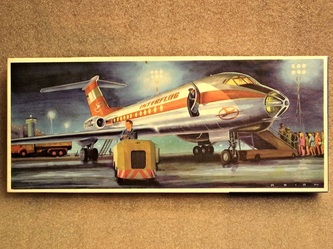 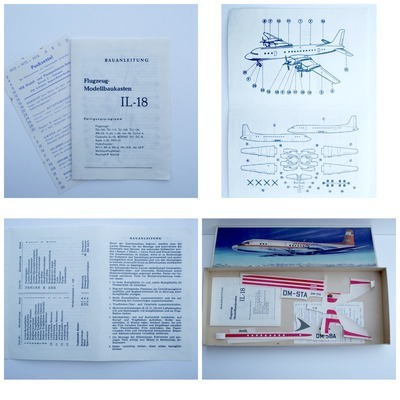 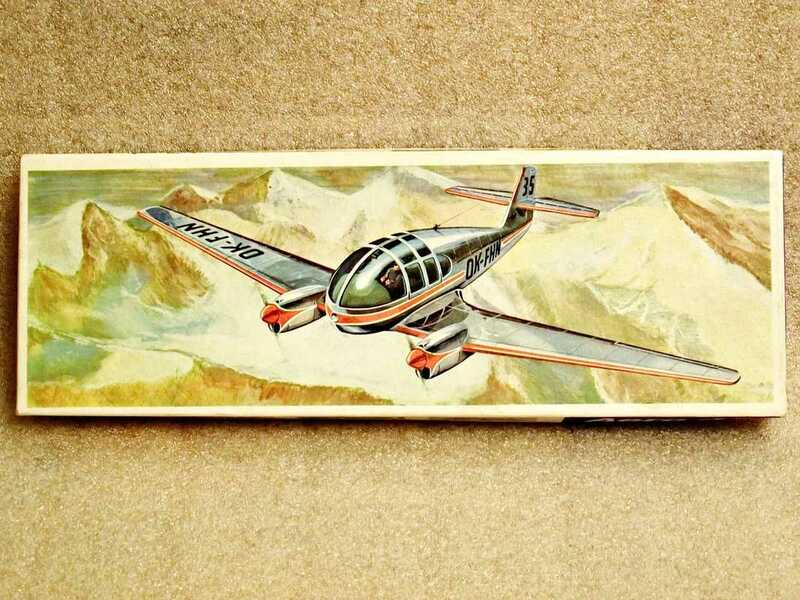 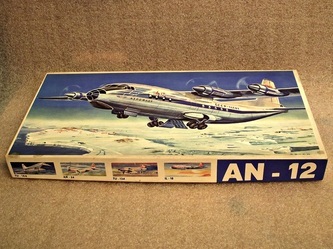 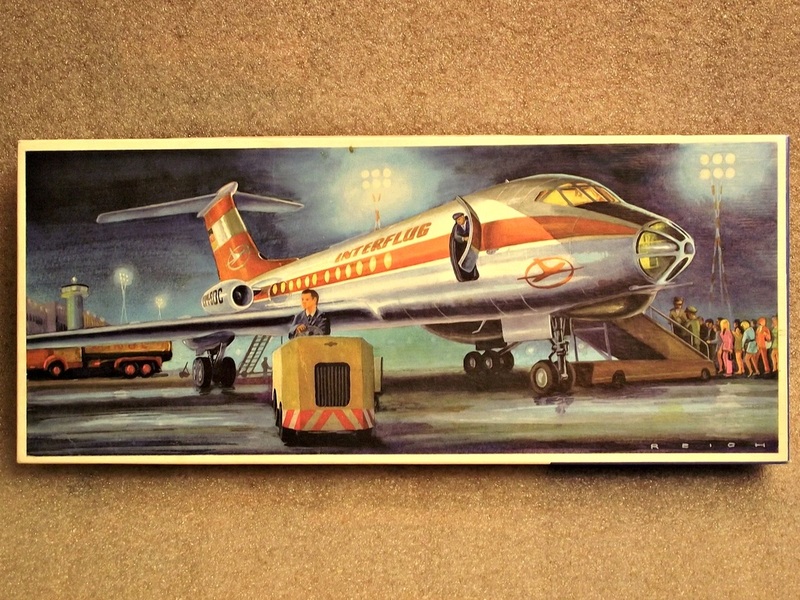 This plastic airplane model kit was the first edition and it was made between 1968-1973 by east German manufacturer VEB Kombinat PLASTICART Plastspielwaren. 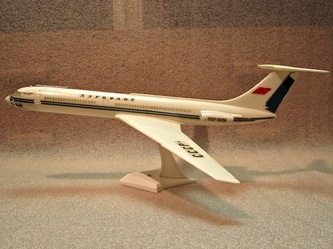 It is a 1:100 scale model. 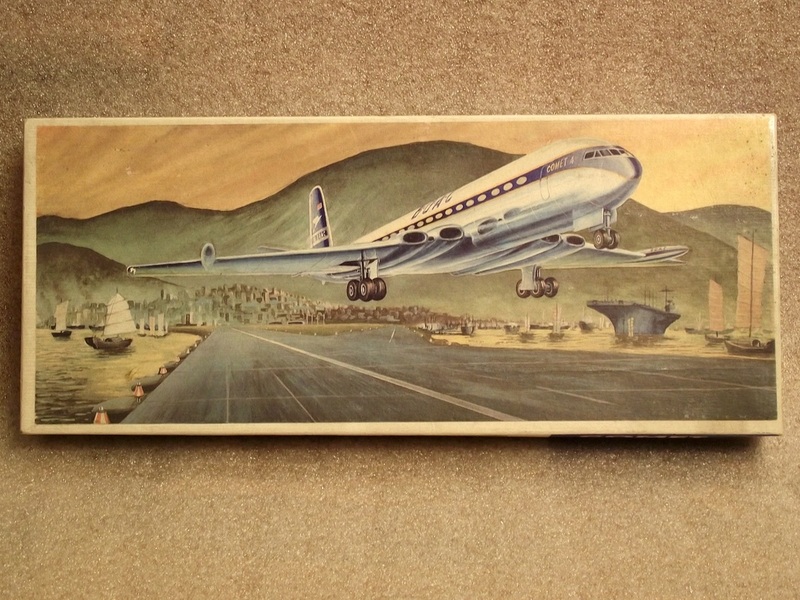 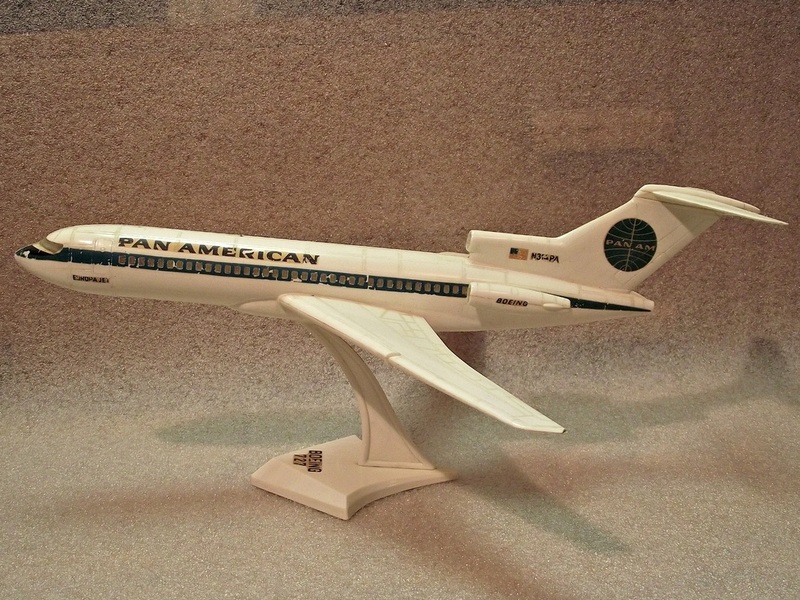 It came with PAN AMERICAN decals for a true to original look. 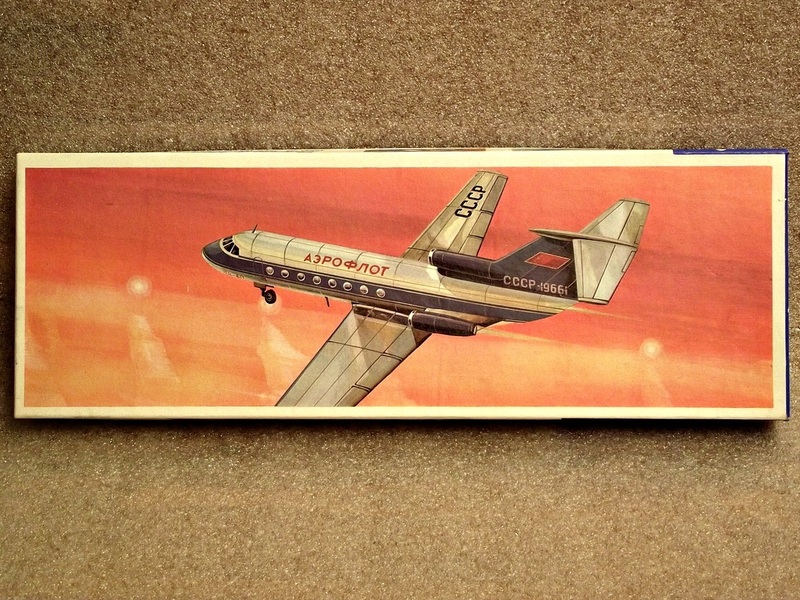 The de Havilland DH 106 Comet was the world's first production commercial jet airliner. 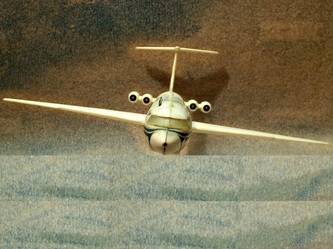 The Comet first flew in 1949 and was a landmark in aeronautical design. 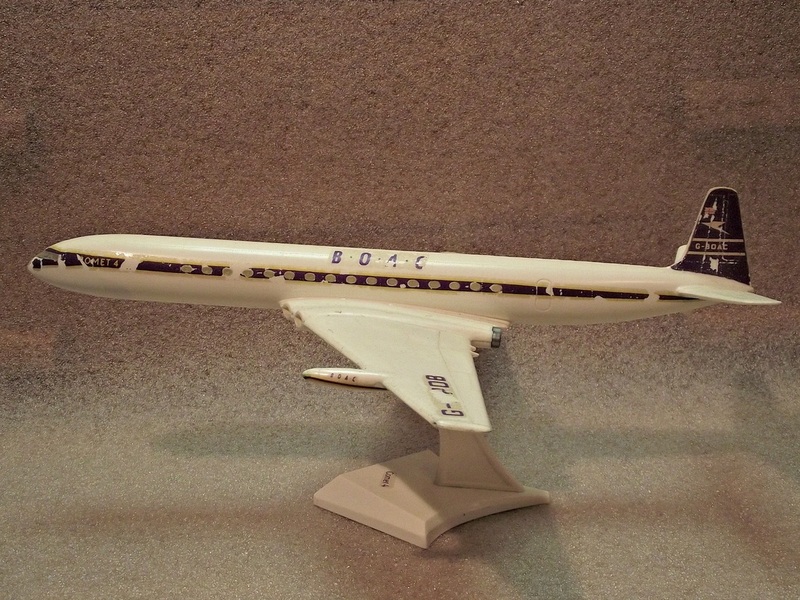 The Comet 4 was considered the definitive series, having a longer range, higher cruising speed and higher maximum takeoff weight. This model kit is the second edition and it was made between 1973-1986 by east German manufacturer VEB Kombinat PLASTICART Plastspielwaren at a 1:100 scale. True to the original it uses B O A C (British Overseas Airways Corporation) decals as used during the 1950's and 1960's. 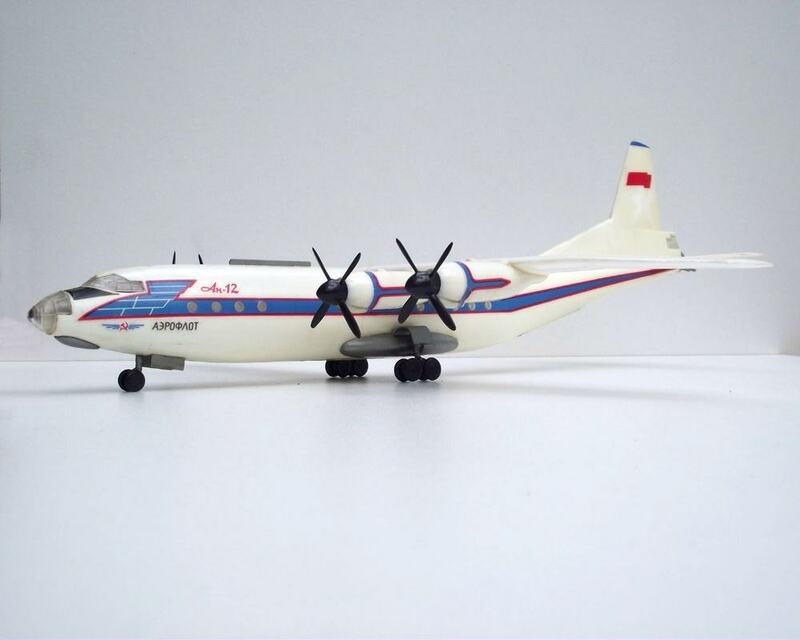 The Ilyusin IL-18 large turboprop airilner first flew in 1957 and it was built until 1985. 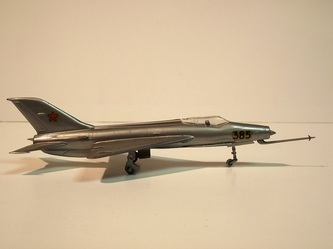 It is one of the best known and durable Soviet aircraft of it's era. 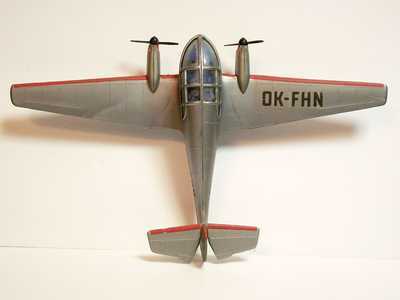 In 1958 the aircraft was awarded the Brussels World Fair Grand Prix. 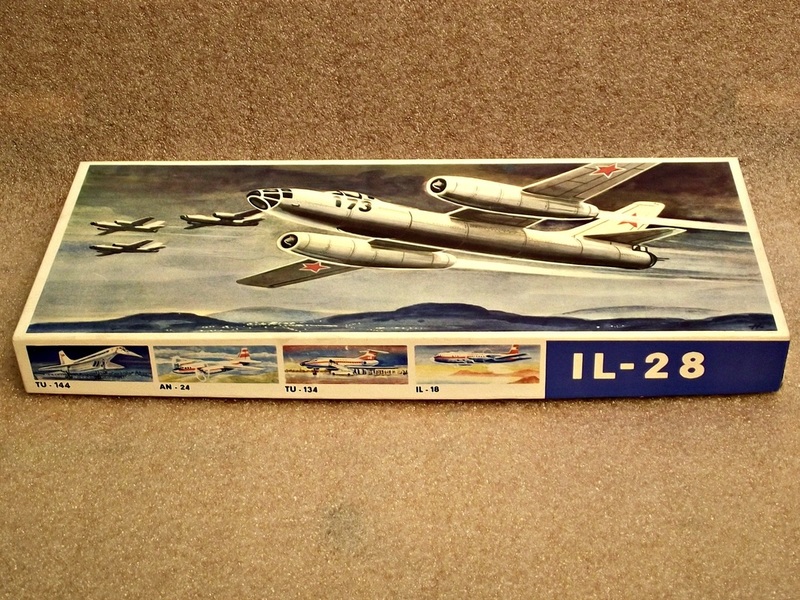 The sucessor of this aircraft is the IL-62. 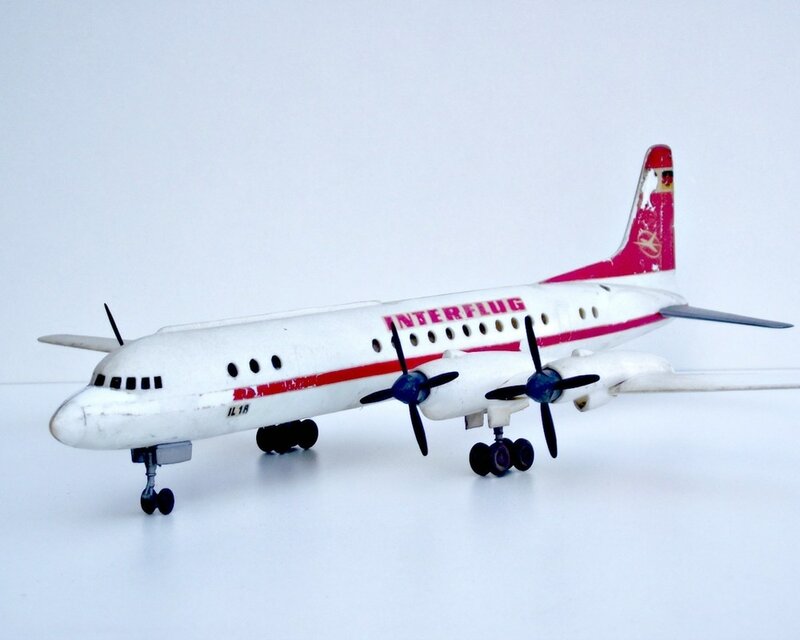 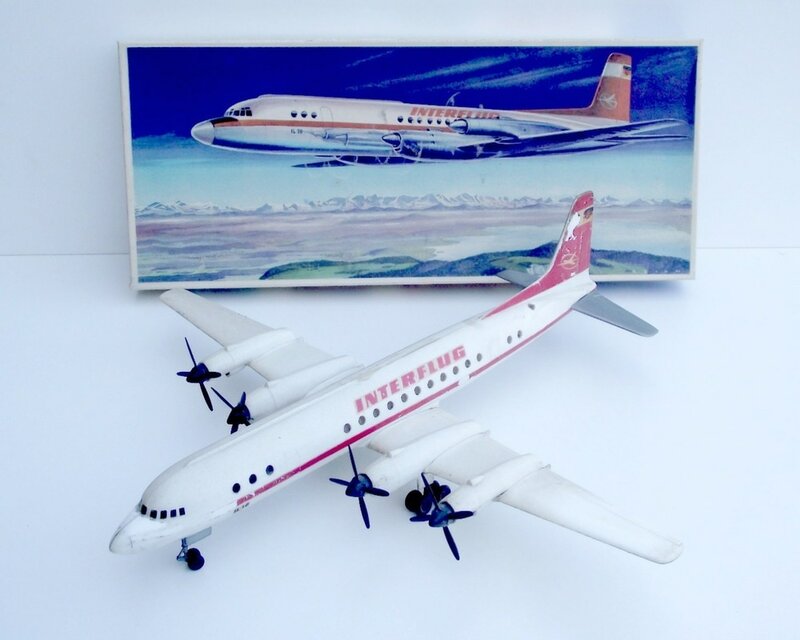 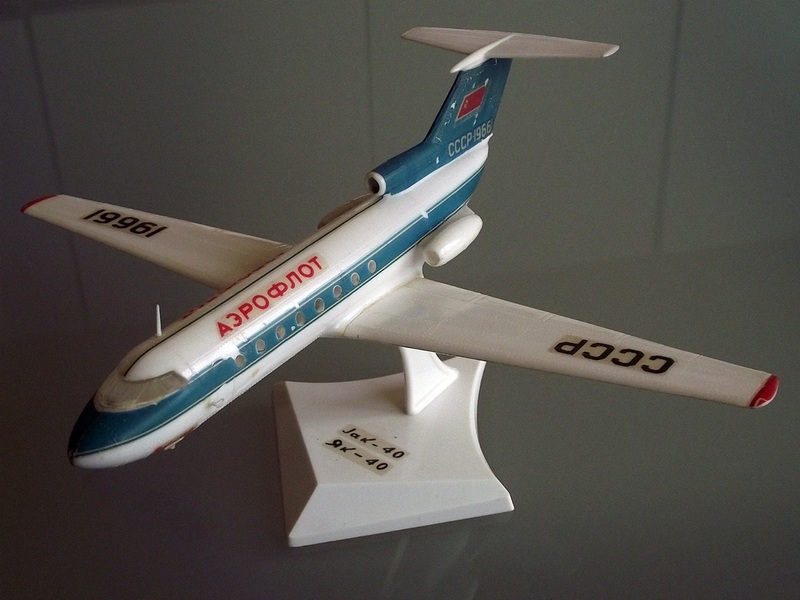 The IL-18 plastic scale model presented here was made by VEB Plasticart and acording to the "Packzettel" (inlay) it was made on 12th of June 1973. 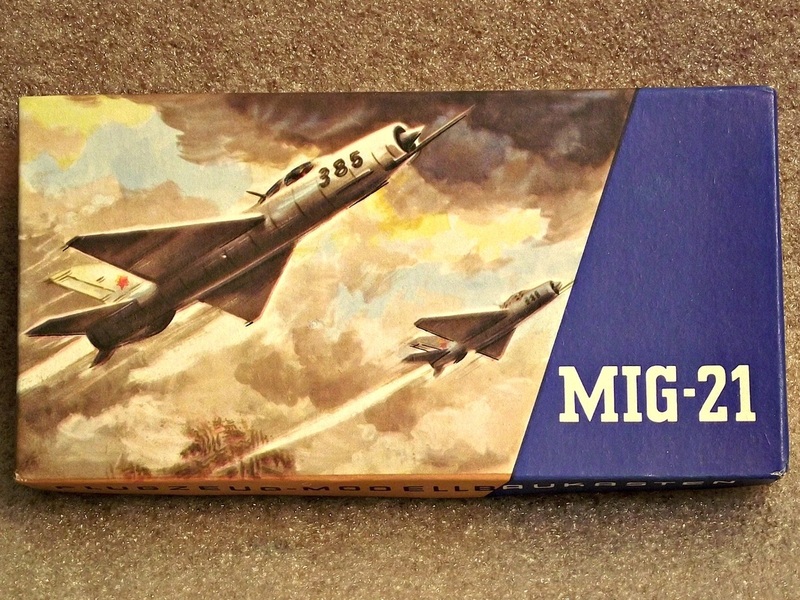 The package contained white, black and silver plastic components, decals and glue. 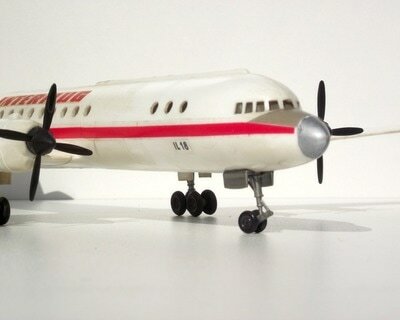 On a correctly assembled model the wheels are turning, the front wheel can be rotated and the propellers are rotating. 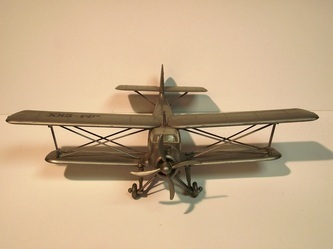 In the last 20 years the model was stored in the attic gathering dust so it became very dirty and needed some cleaning. 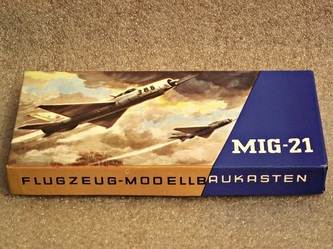 After some dry brush and wet cleaning some of the decals came off (see the last pictures) so in February 2017 when the pictures were taken I've added a few pieces of decals that remained in excess in the box. The decals were still good to use after 40+ years. The box cover art is signed REICH, scale is 1:100. 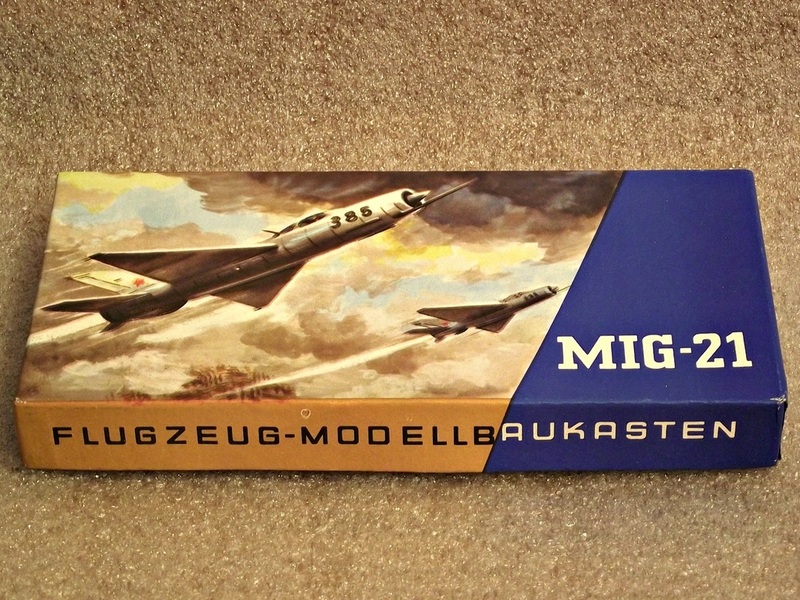 This model kit was made between 1970-1991 by east German manufacturer VEB Kombinat PLASTICART Plastspielwaren at a 1:100 scale. 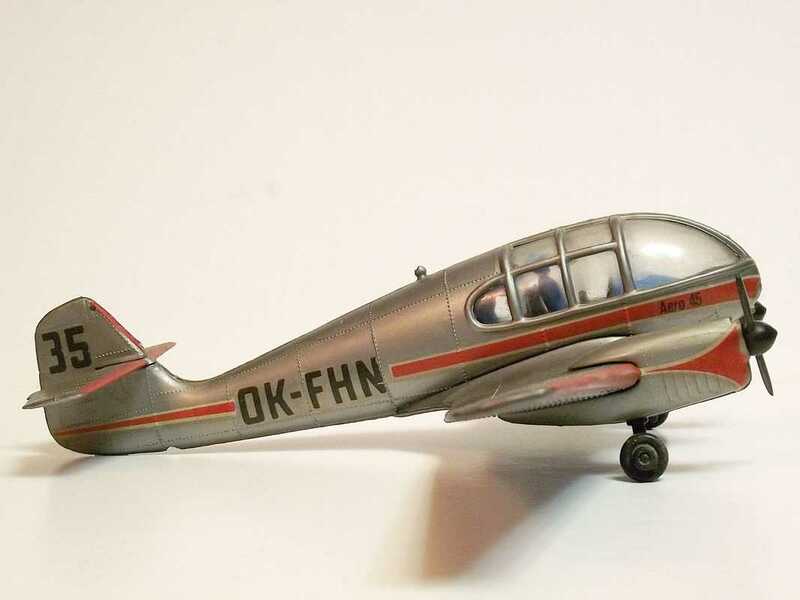 This model kit was made between 1968-1987 by east German manufacturer VEB Kombinat PLASTICART Plastspielwaren at a 1:100 scale. Being a successful aircraft it was exported to many other countries. 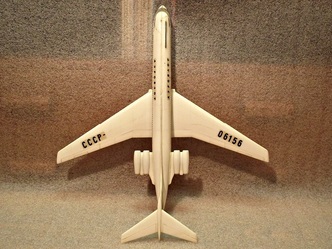 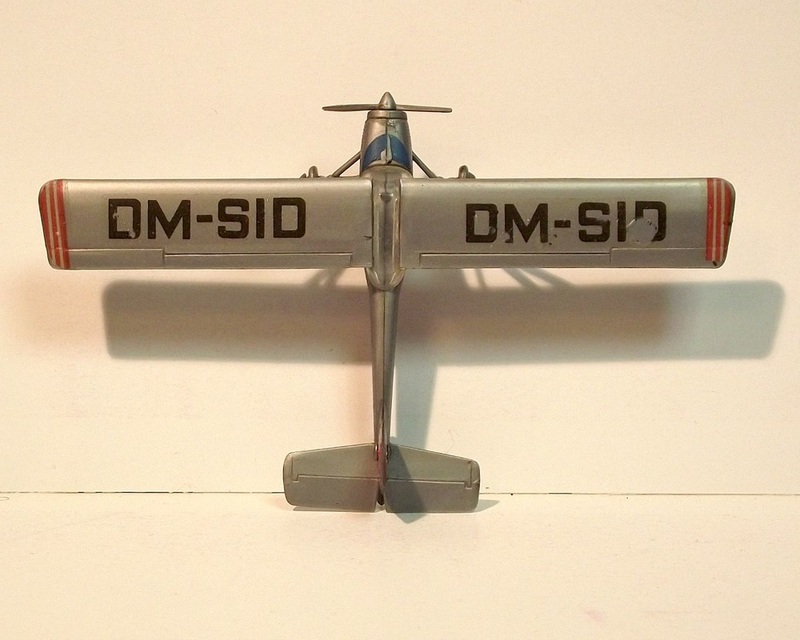 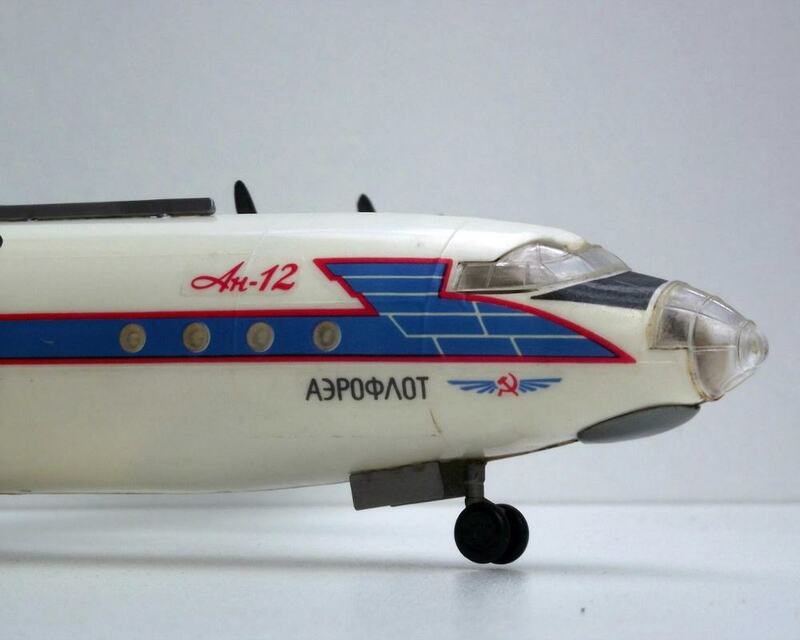 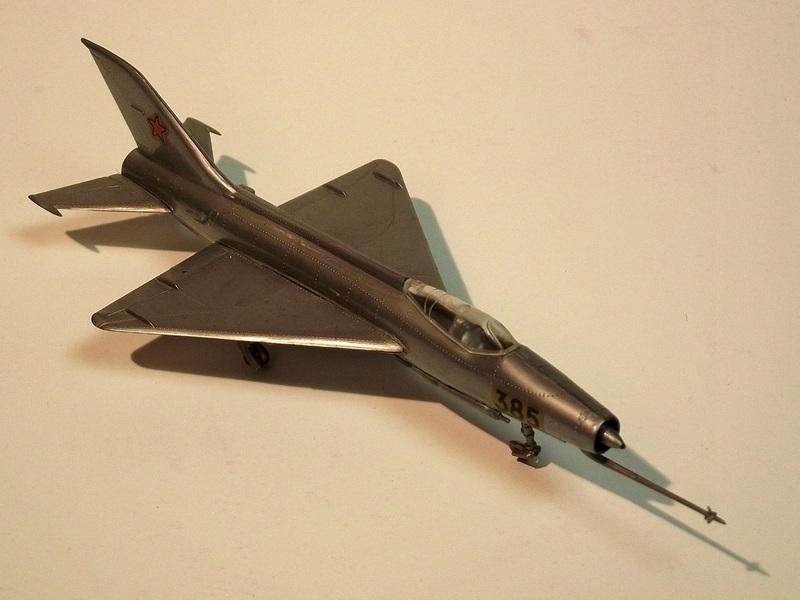 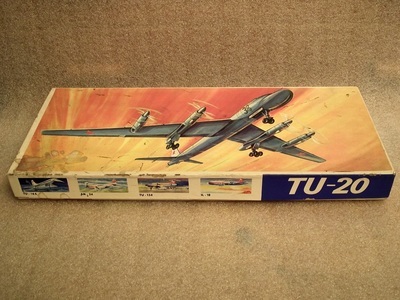 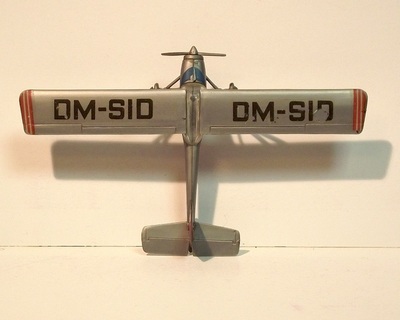 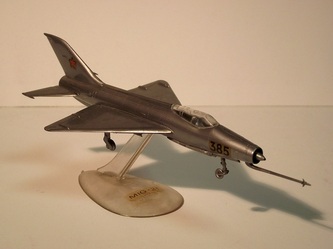 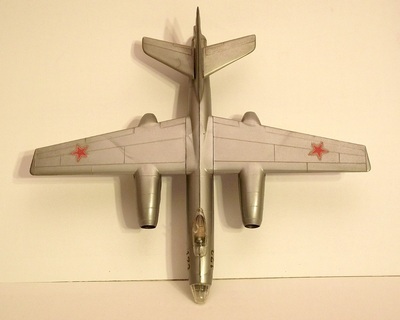 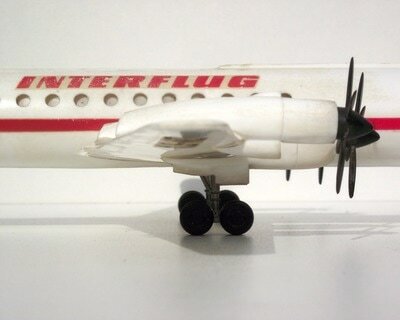 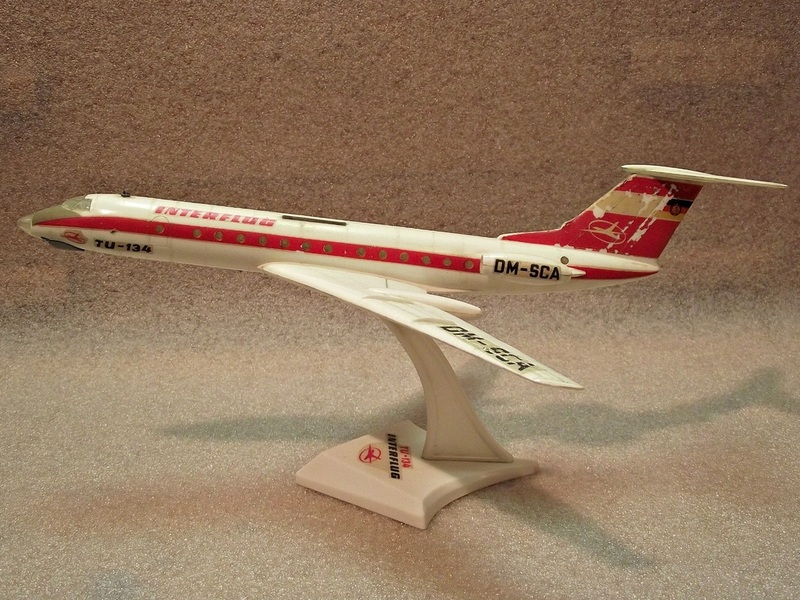 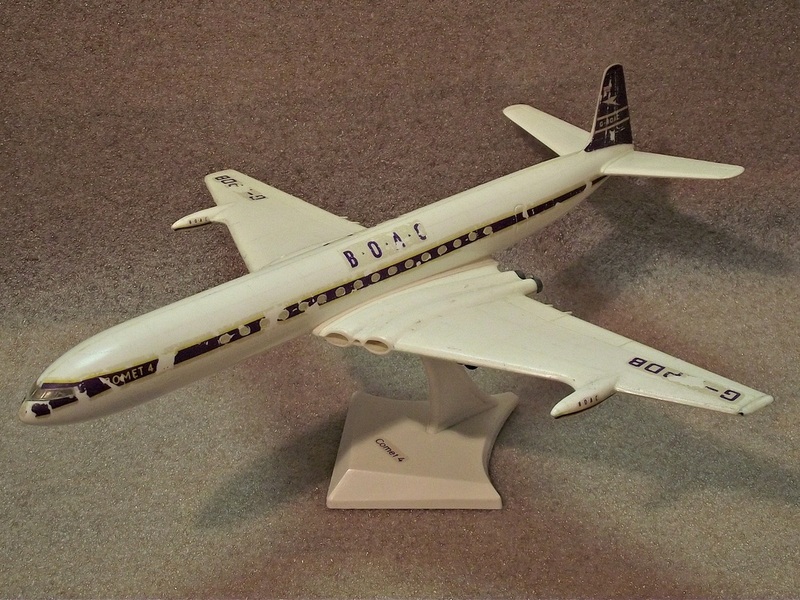 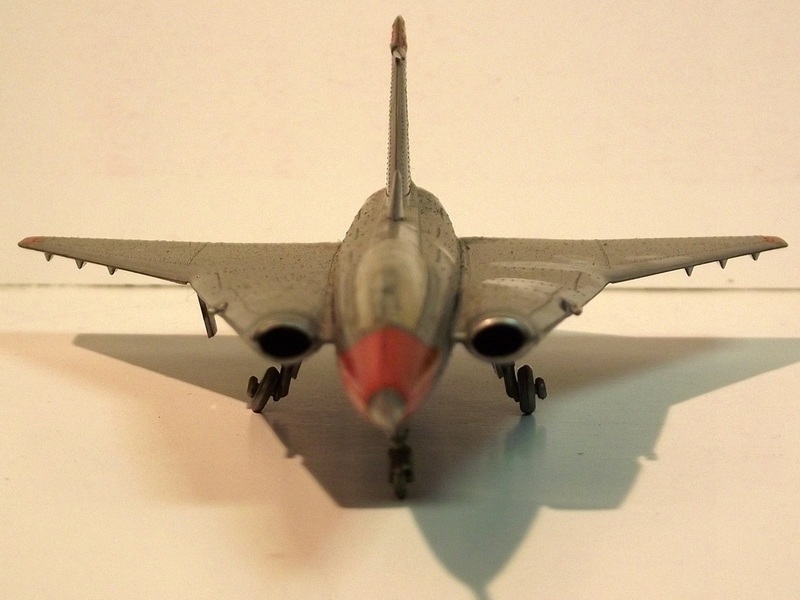 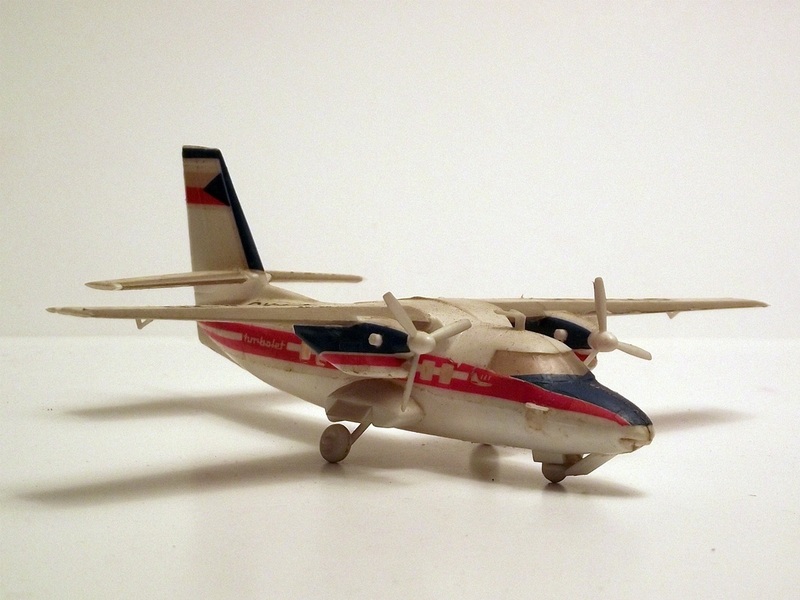 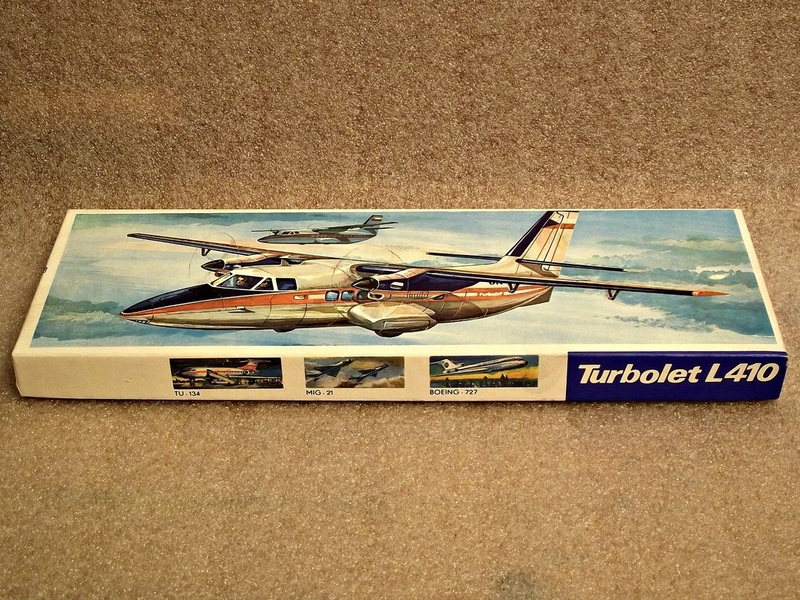 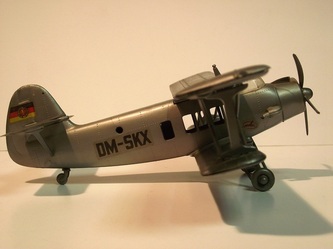 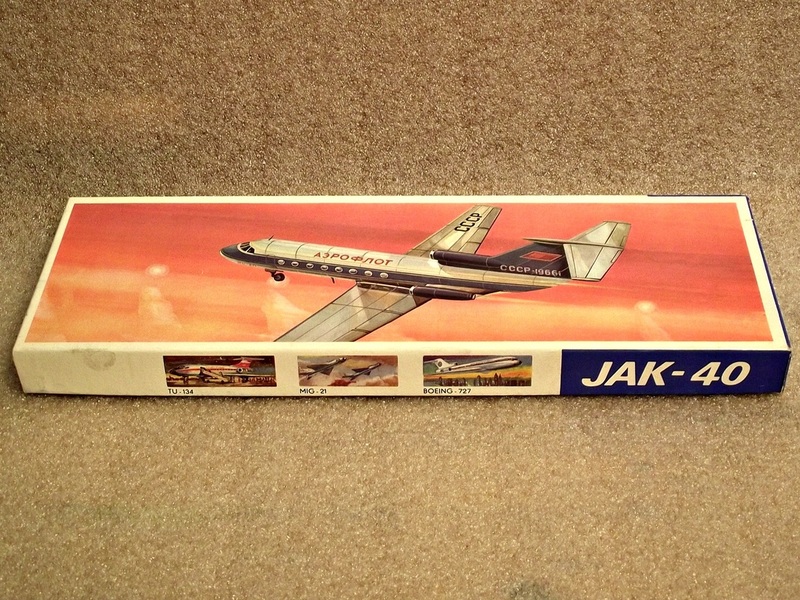 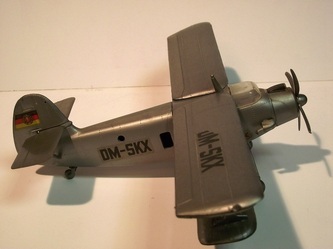 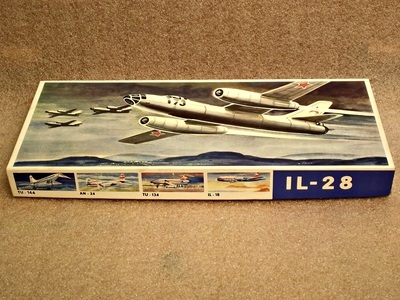 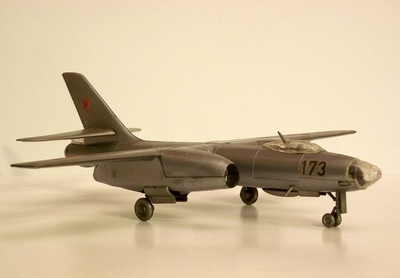 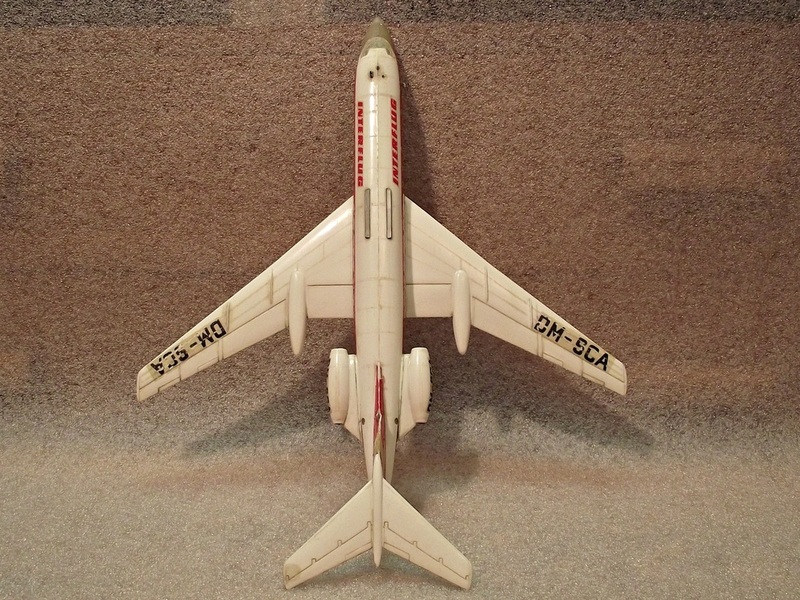 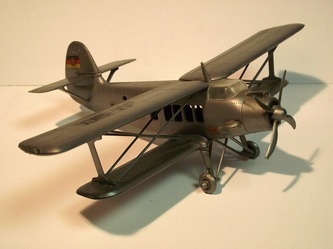 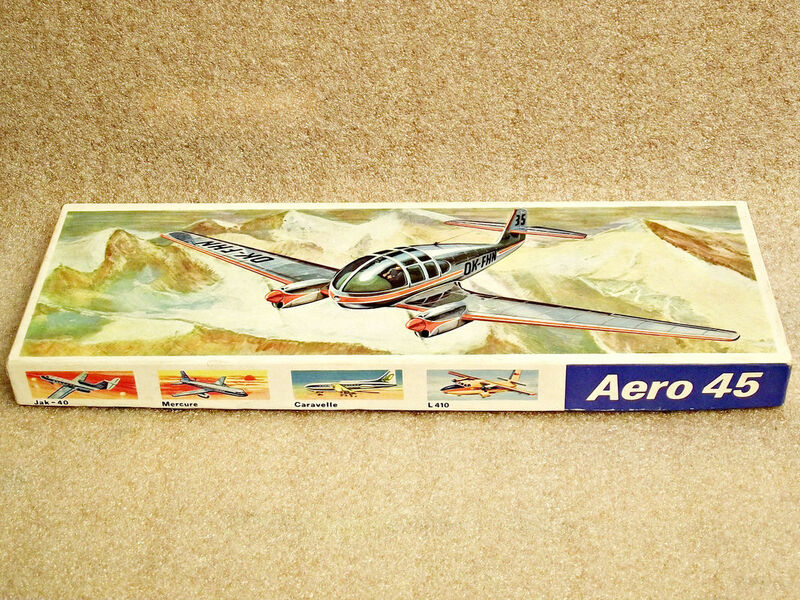 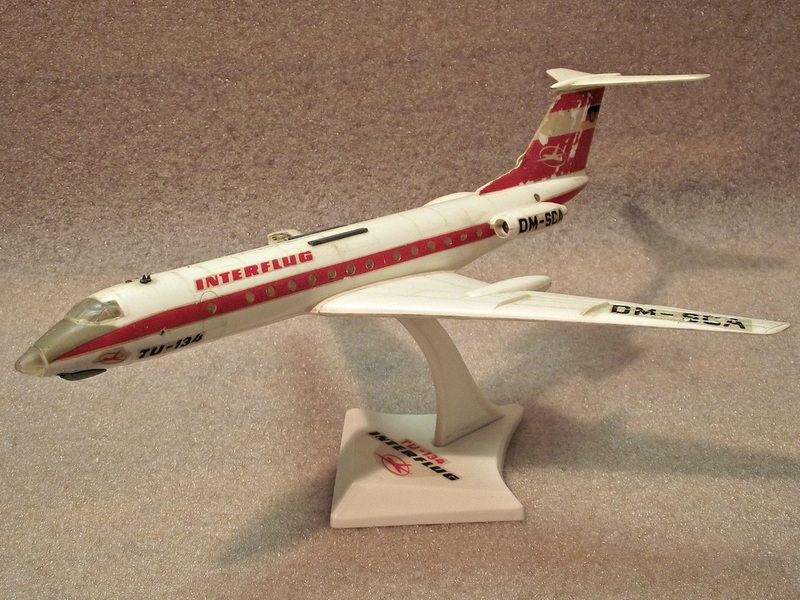 The plastic model came with INTERFLUG (former east German airlnes) and AEROFLOT decals. 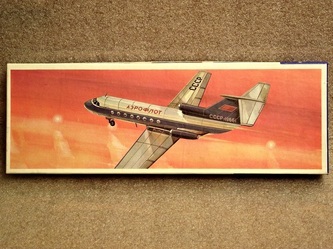 The assambled kit was decorated with AEROFLOT decals for variety as there were already other kits in the collection made with INTERFLUG decals. 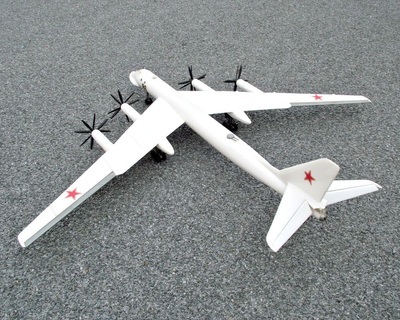 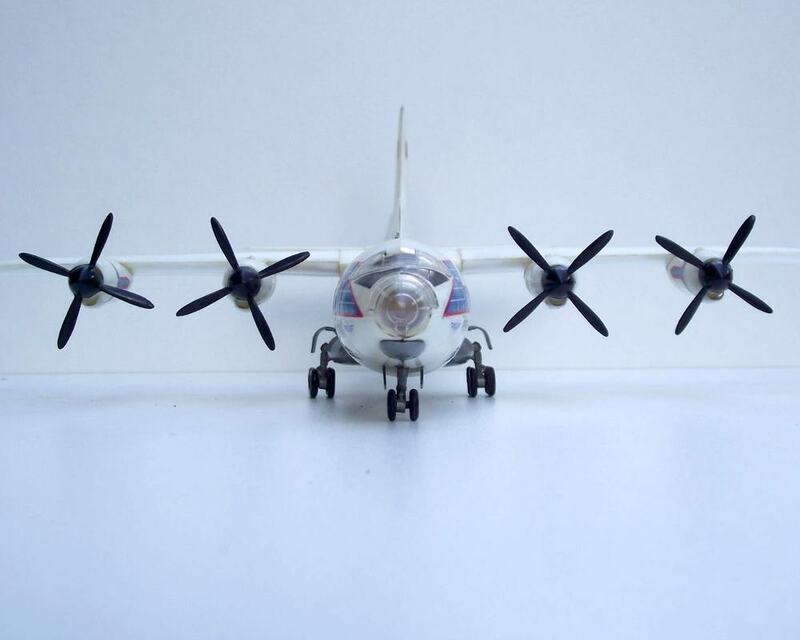 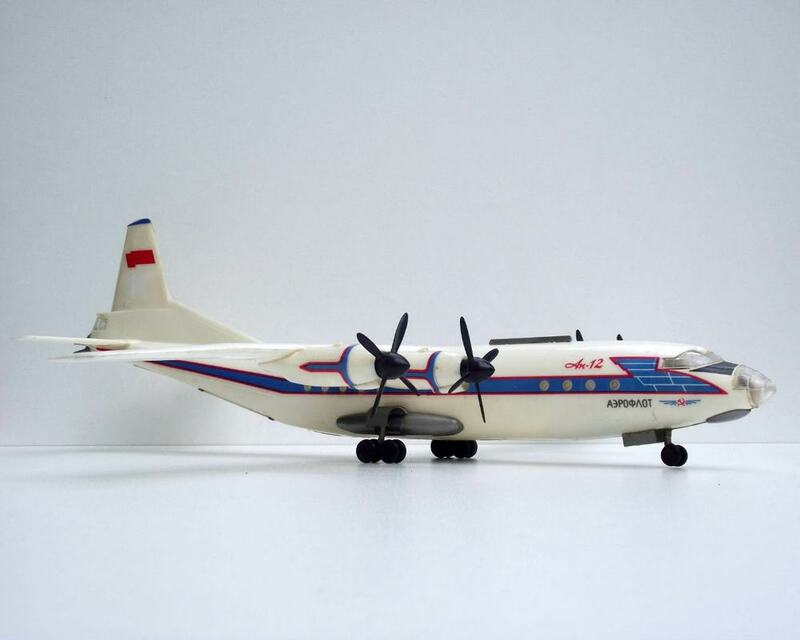 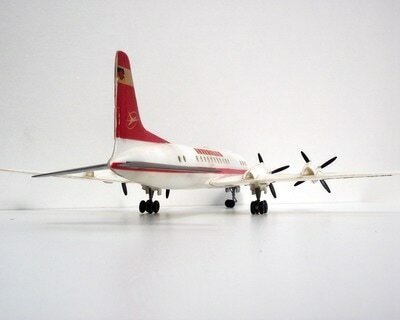 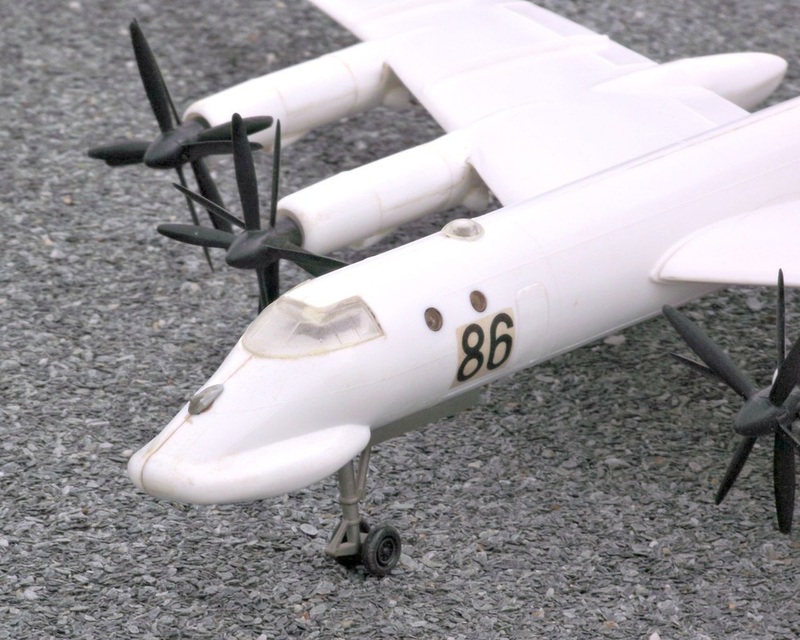 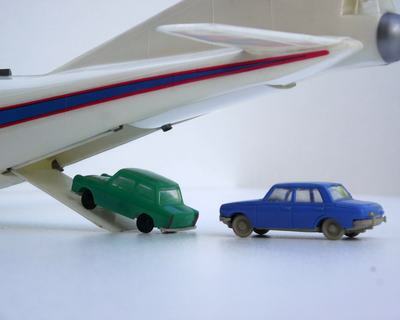 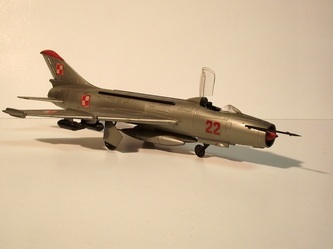 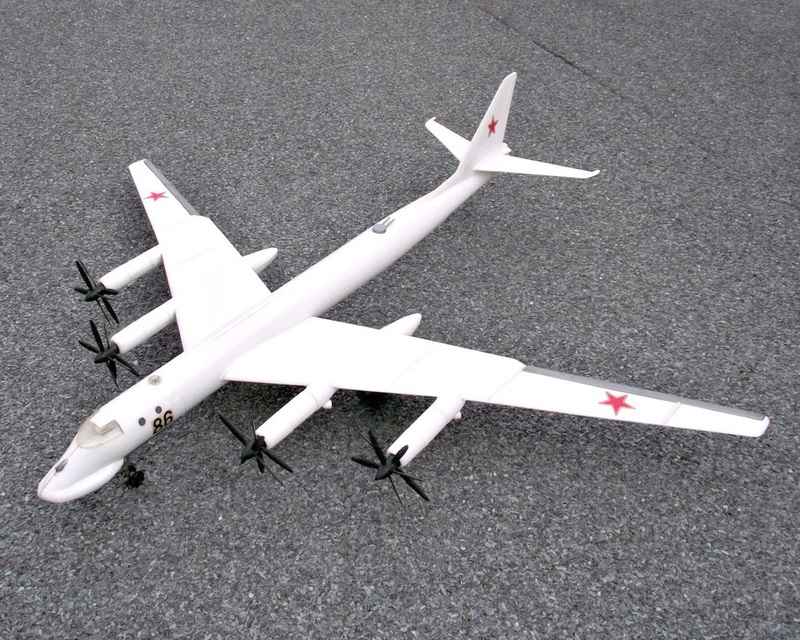 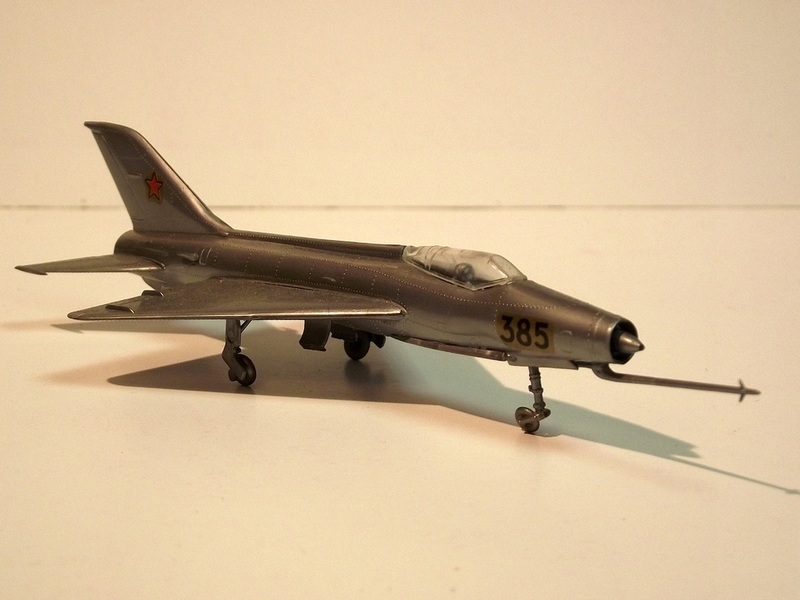 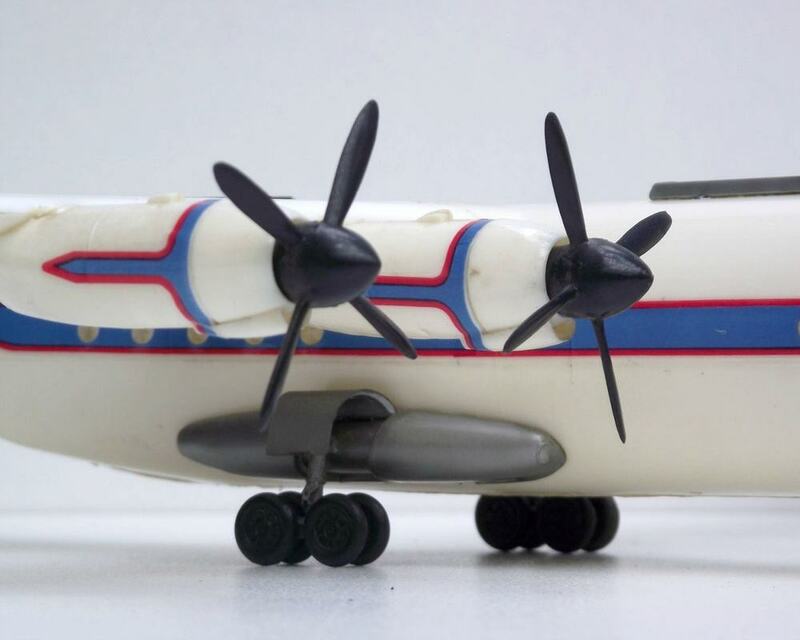 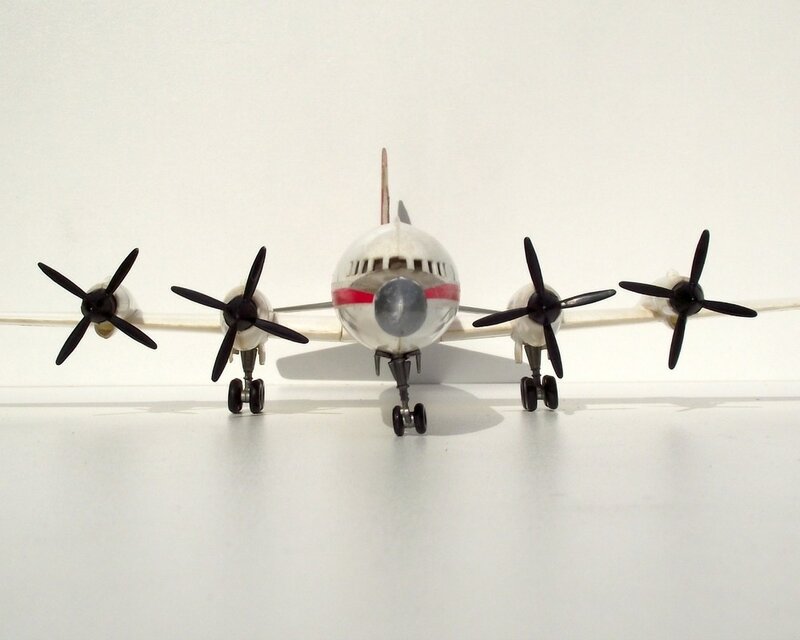 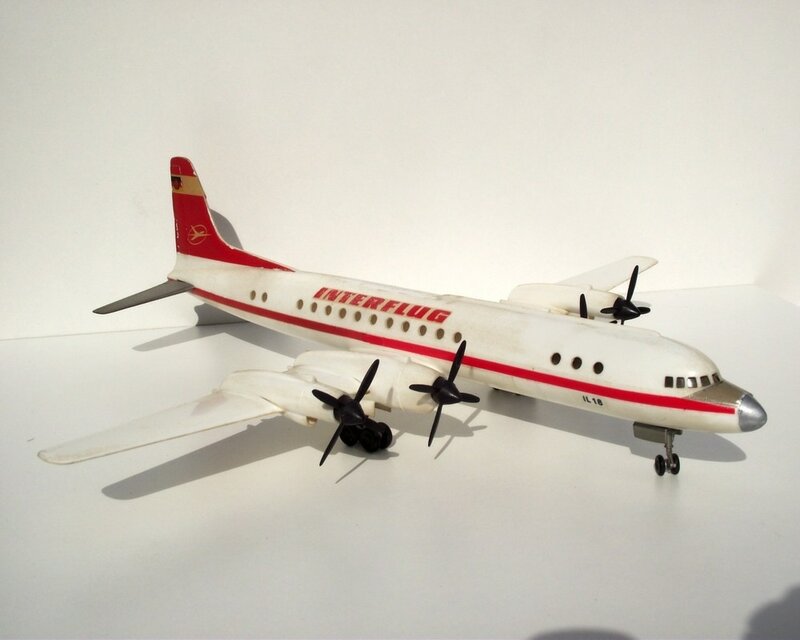 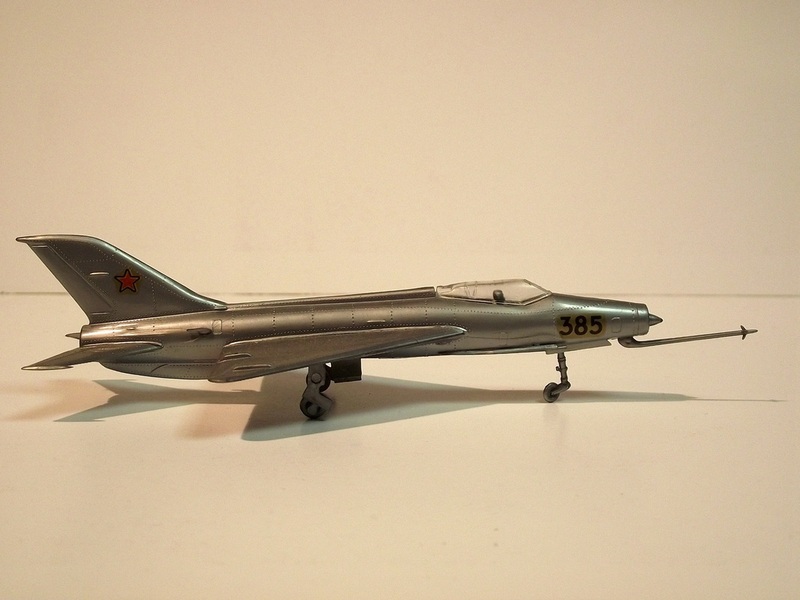 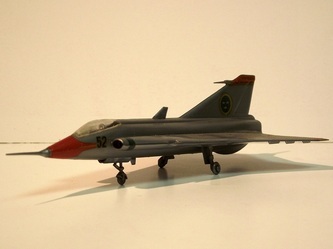 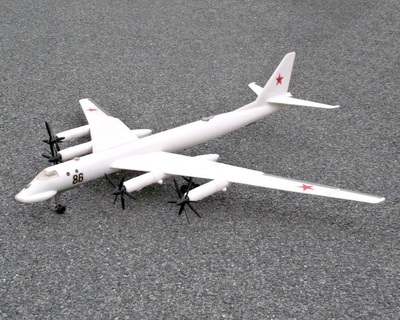 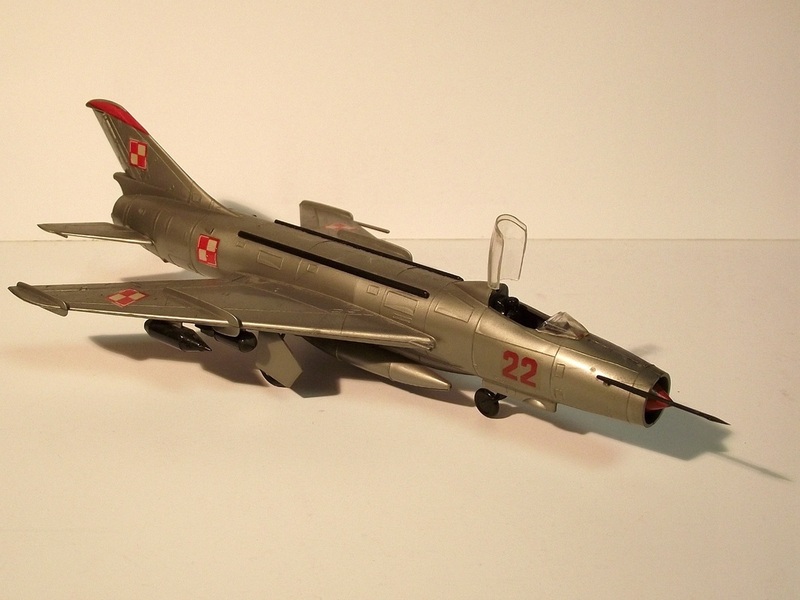 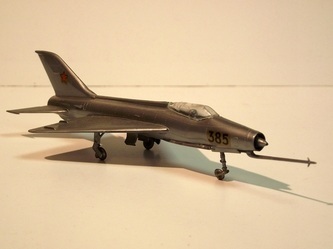 The L-60 is a 1:100 scale model made by VEB Kombinat PLASTICART Plastspielwaren between 1962 and 1988. 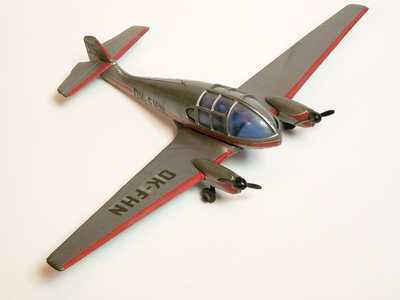 Also known as L-60 "Brigadier" this is a very small aircraft (1 person) with a 13.96 m wingspan. 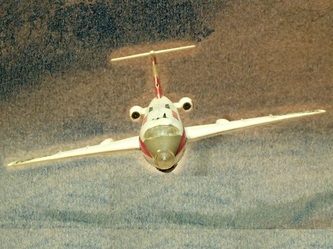 The photos from above show a model from my collection assembled in 1973 using East German markings. 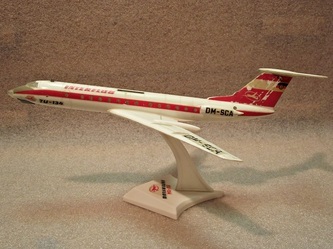 One interesting detail is the fact that the first series (from 1962) was available with "Lufthansa" (West German) markings. 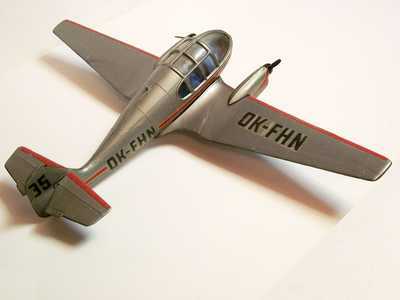 On the side of the airplane is a marking that reads "Wirtschafstflug" which would translate as economy flight, utility aircraft. 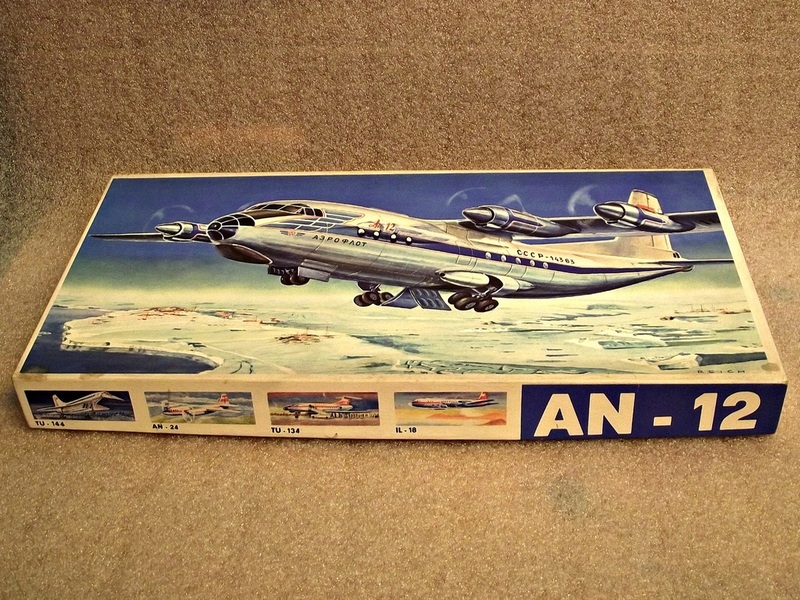 This model kit was made between 1973-1991 by east German manufacturer VEB Kombinat PLASTICART Plastspielwaren at a 1:100 scale. 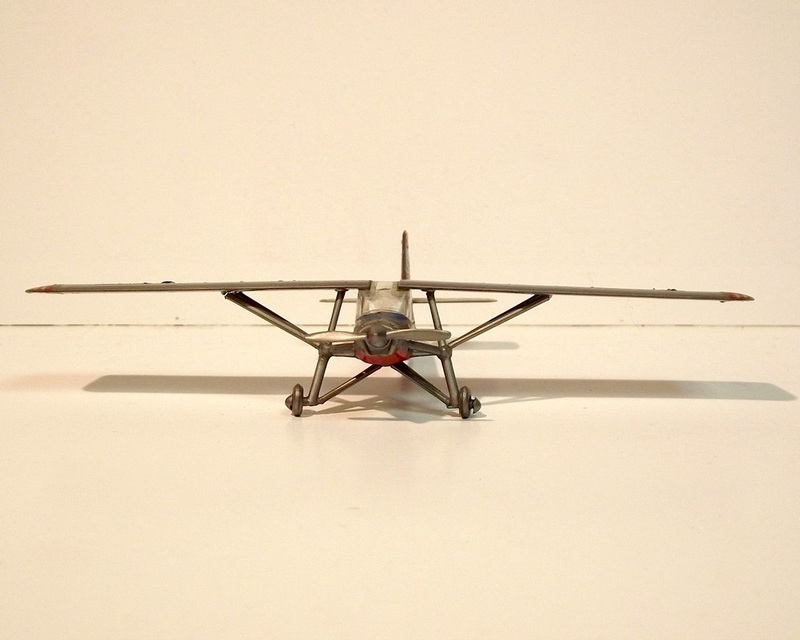 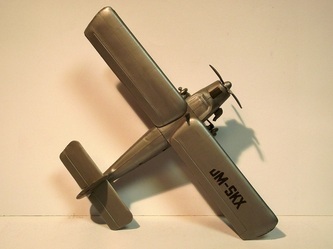 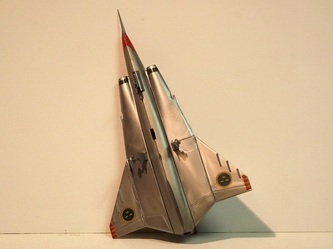 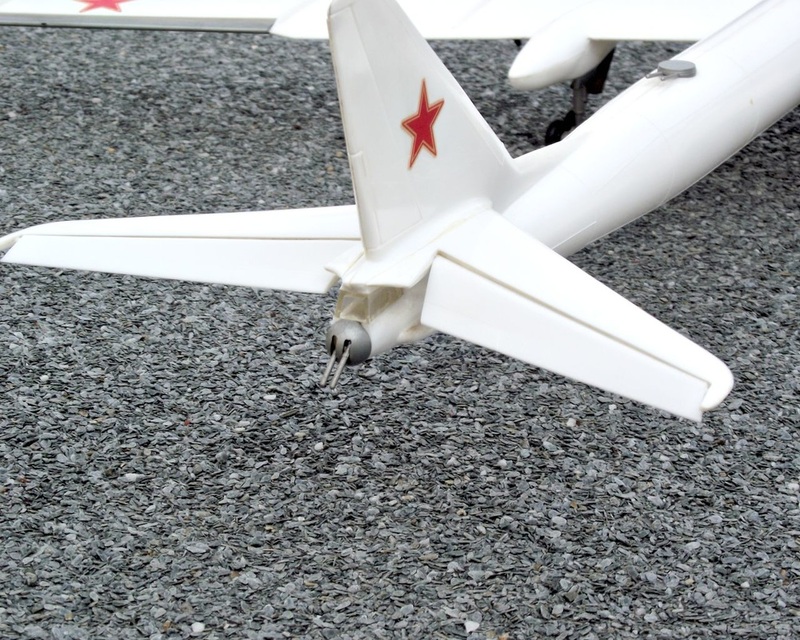 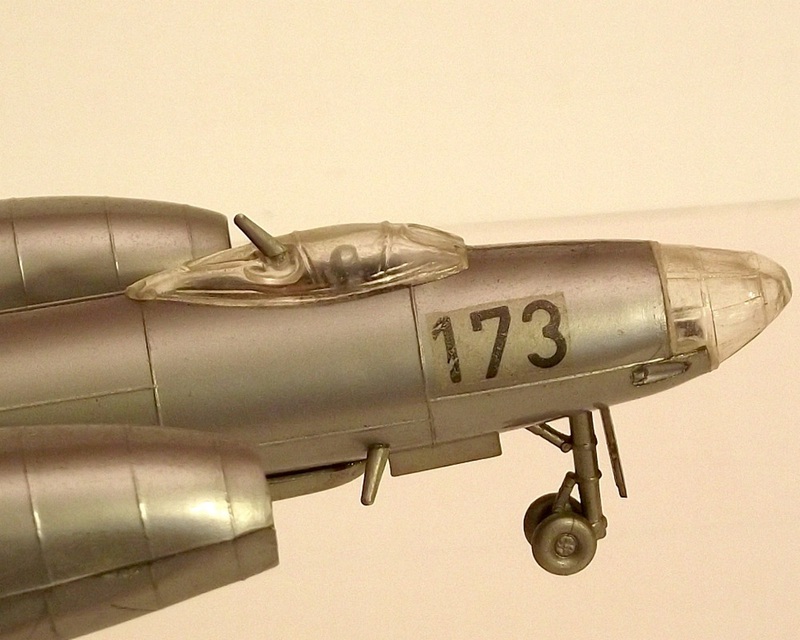 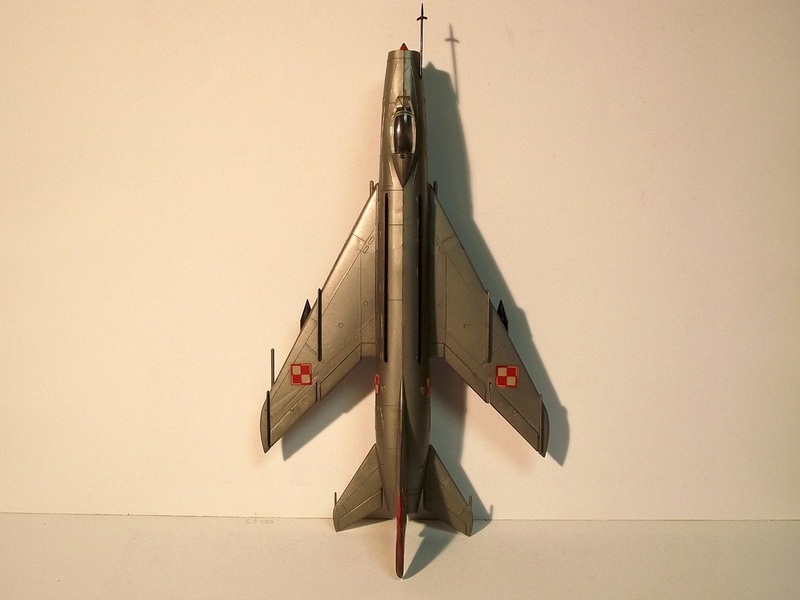 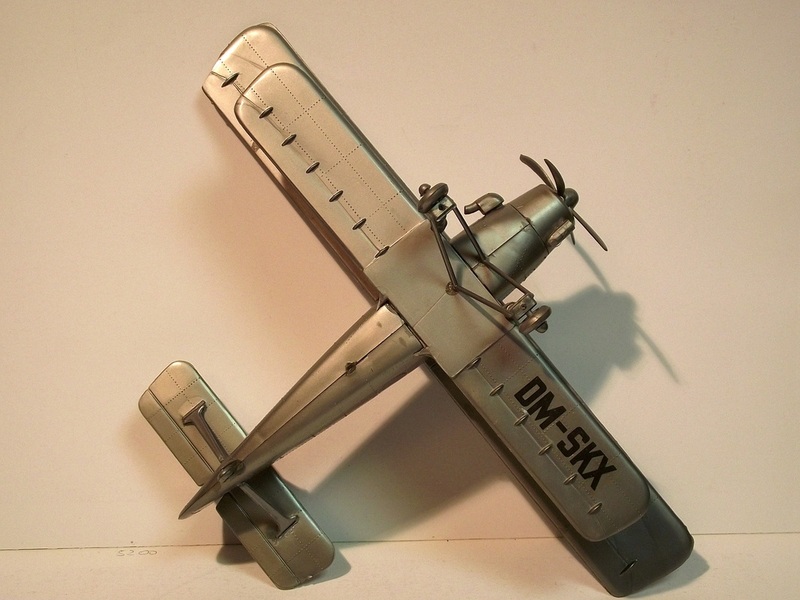 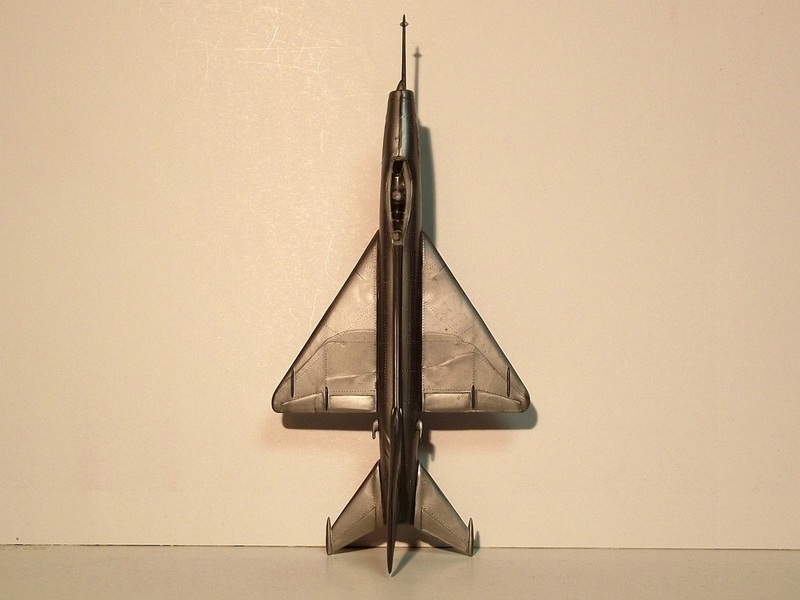 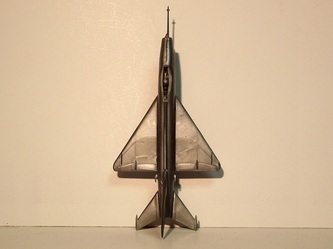 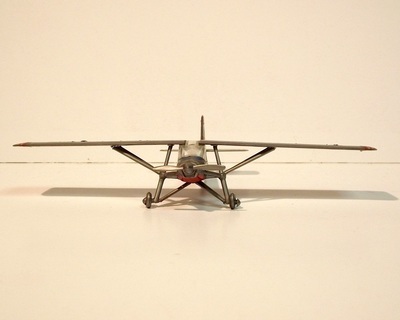 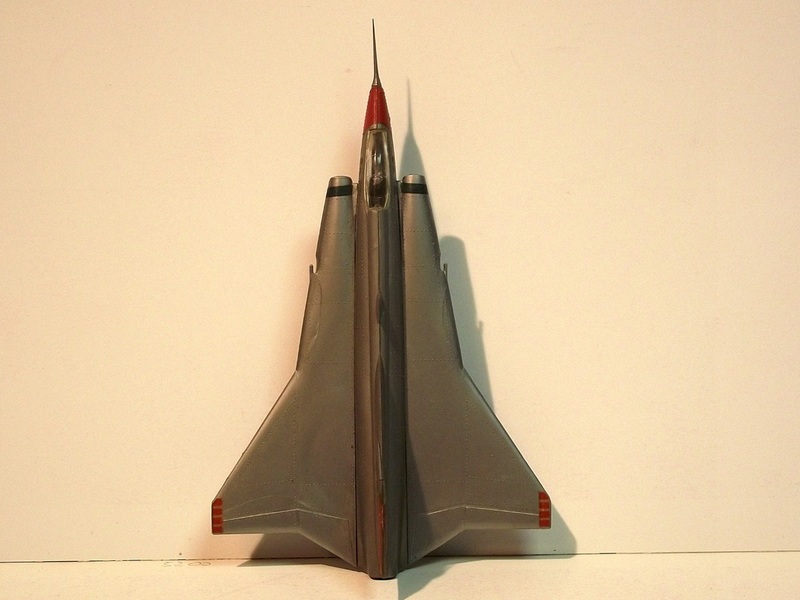 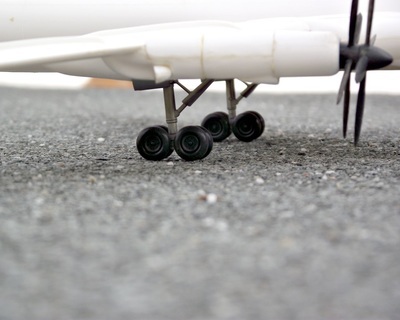 All the components of this model aircraft are made of silver plastic. 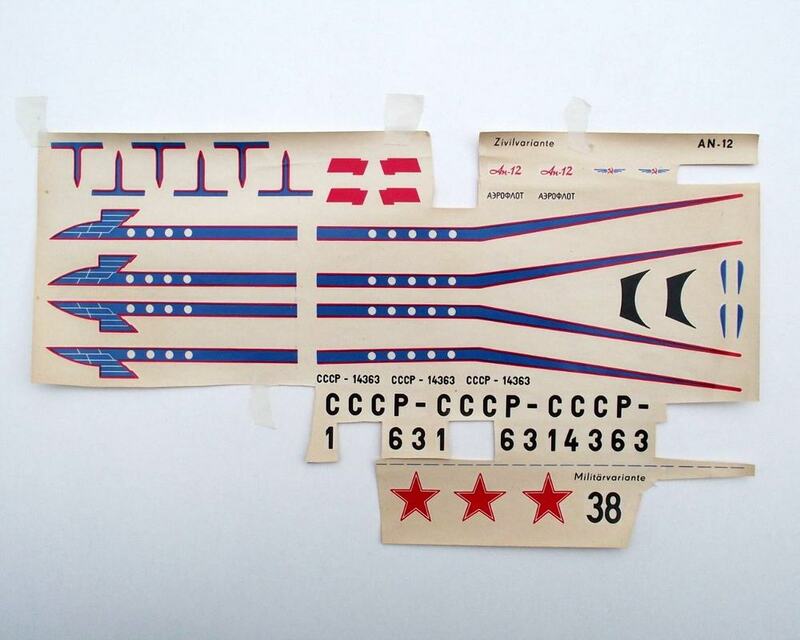 The decals used were a former Soviet military aircraft, see the Red Star on the wings. 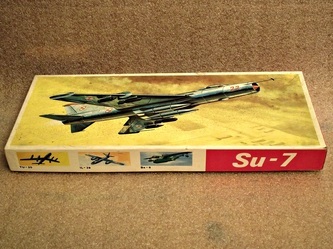 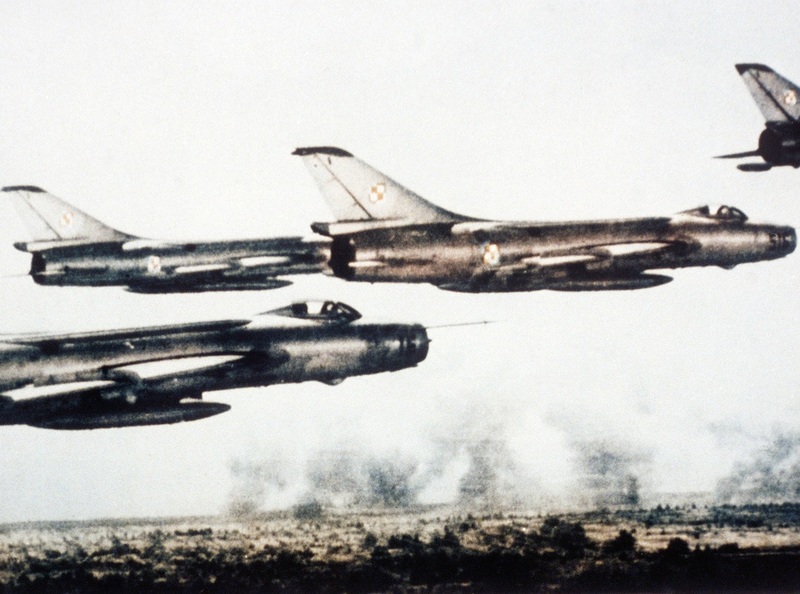 The Sukhoi Su-7 was a swept wing, supersonic fighter aircraft developed by the Soviet Union in 1955. 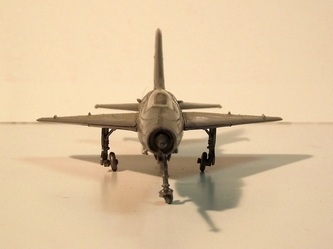 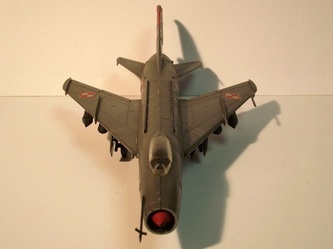 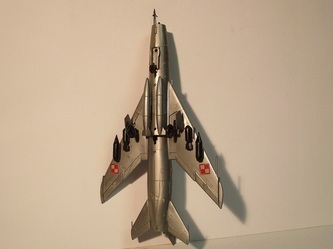 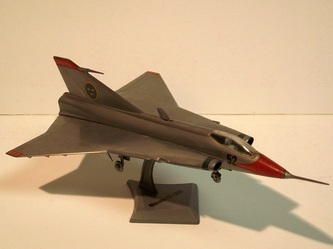 Originally, it was designed as tactical, low-level dogfighter, but was not successful in this role. 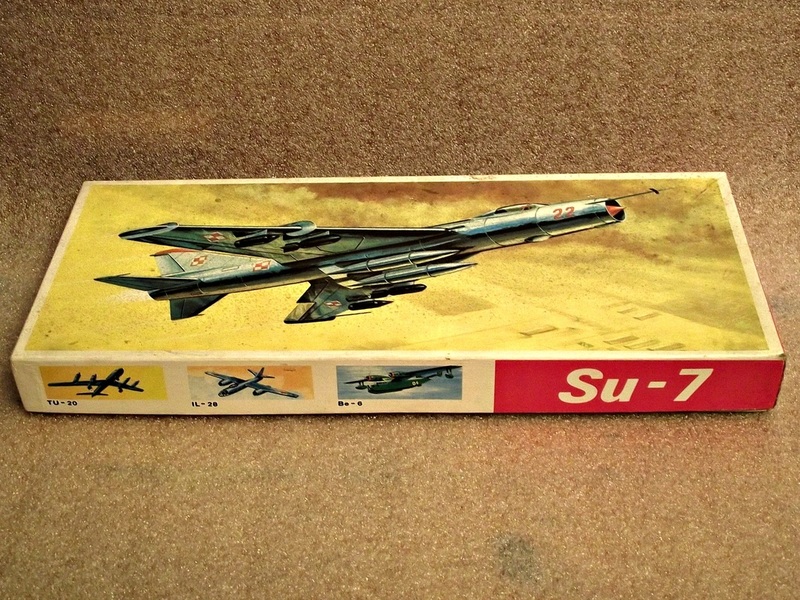 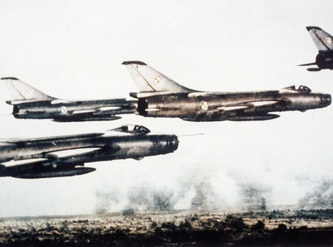 On the other hand, soon-introduced Su-7B series became the main Soviet fighter-bomber and ground-attack aircraft of the 1960s. The Su-7 was rugged in its simplicity but its shortcomings included short range and low weapon load. Despite its notoriously heavy controls, the Su-7 was popular with pilots for its docile flight characteristics, simple controls and considerable speed even at low altitudes. 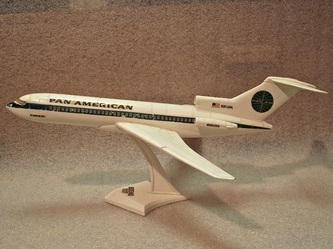 It was produced between 1959 and 1986. 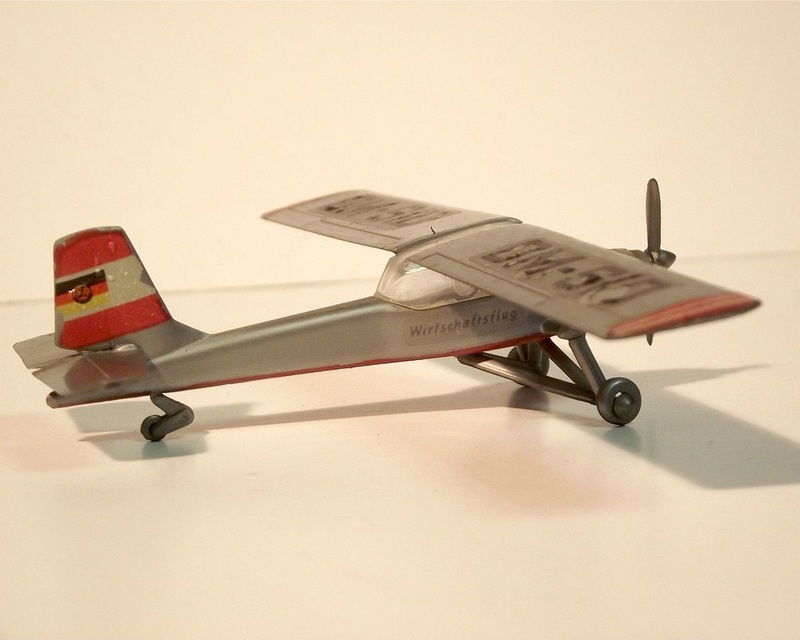 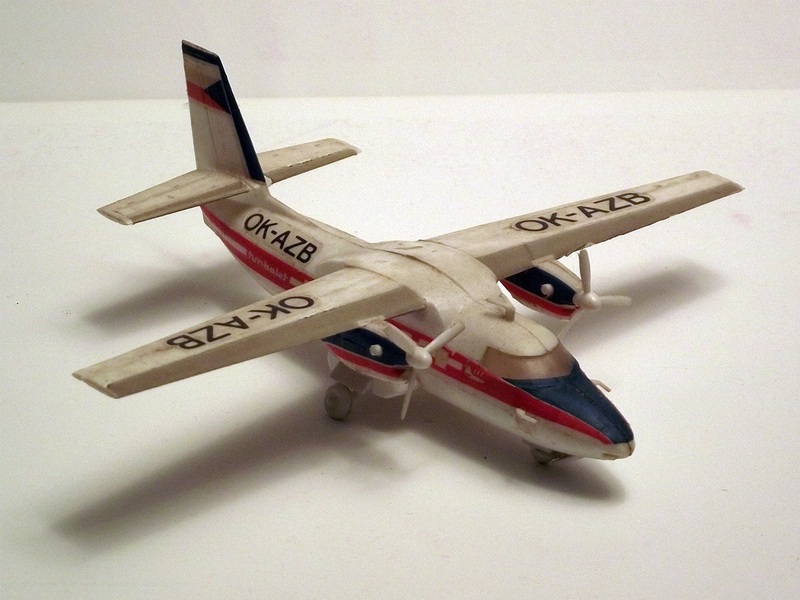 This plastic airplane model kit was made between 1973-1991 by east German manufacturer VEB Kombinat PLASTICART Plastspielwaren. 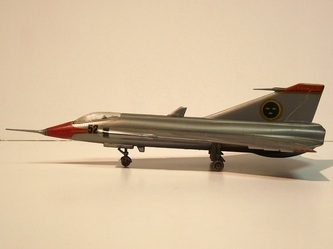 It is a 1:72 scale model. 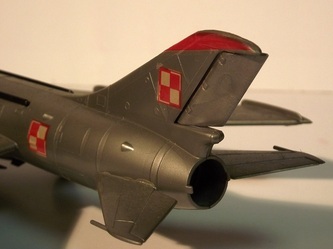 The decals on this aircraft are from the former polish airforce as seen on the boxart. If the aircraft model was correctly assembled the transparent cockpit is opening and the tailplane was moving. 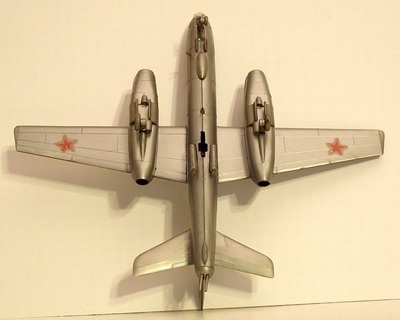 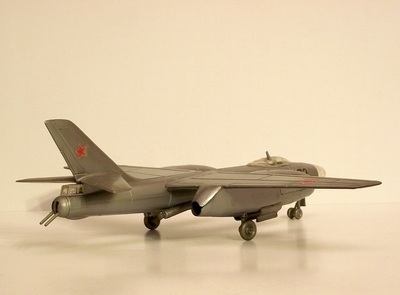 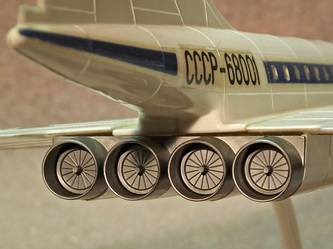 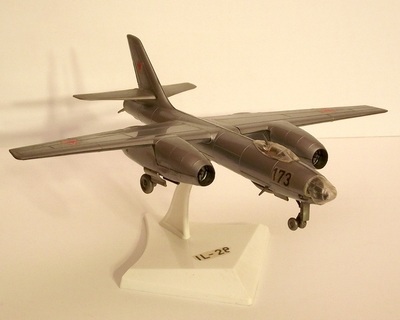 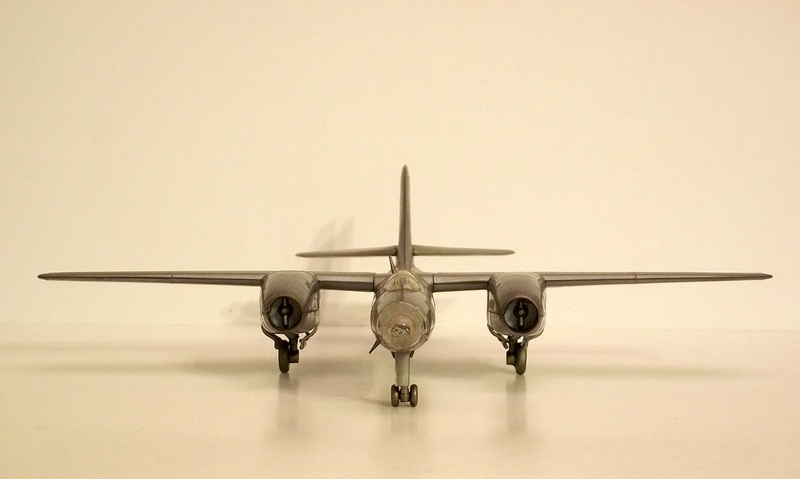 It was the first Soviet aircraft to utilize the all-moving tailplane so this was considered an important detail of the model kit. 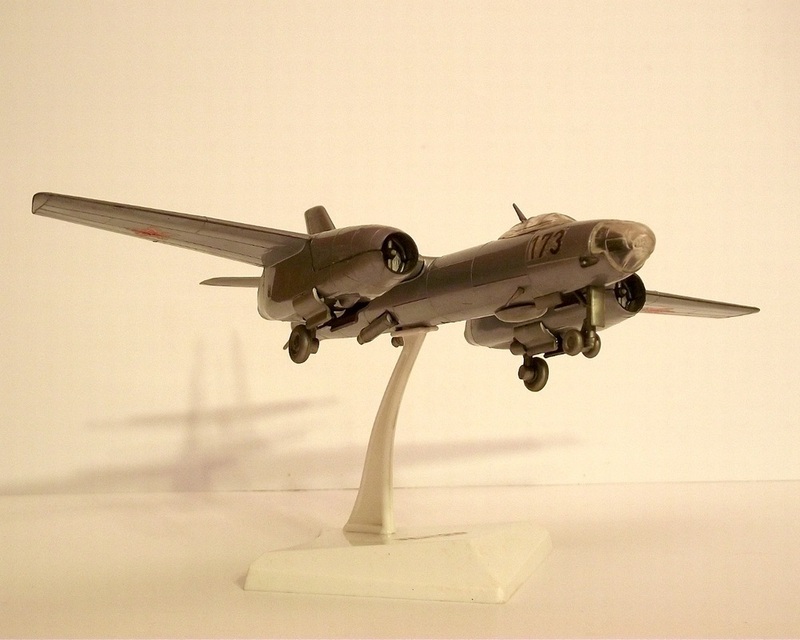 The TU-20 is a large, four-engine turboprop-powered strategic bomber and missile platform that entered service in the Soviet Union in 1956. 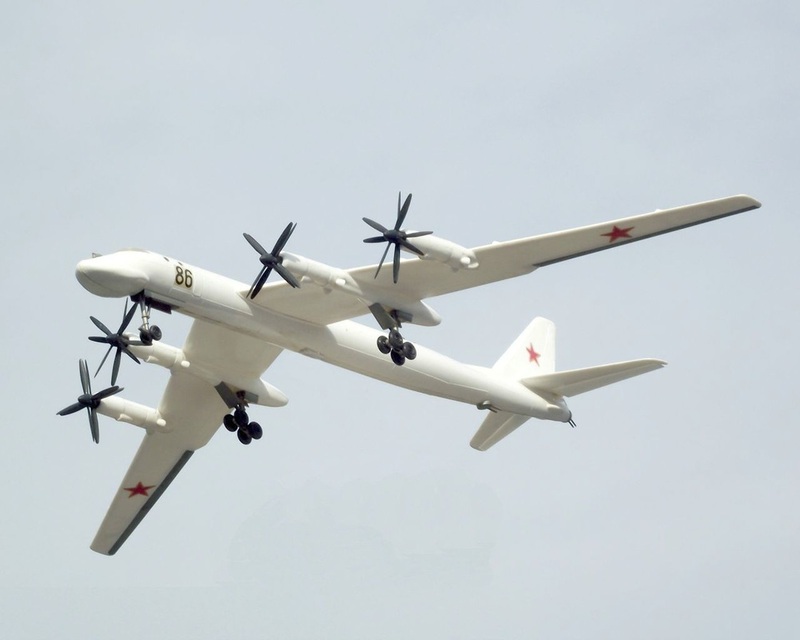 By the time it was supplied to operational units the plane was known as TU-95 in the USSR but still known as TU-20 "Bear" to US/NATO intelligence. 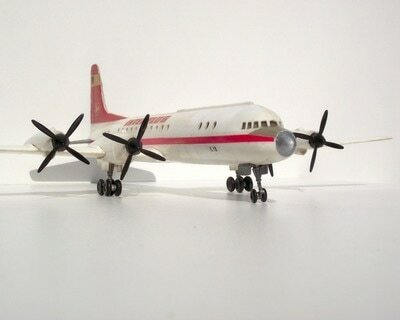 This plastic scale model was made on 30th of March 1976 by VEB Plasticart East-Germany at a 1:100 scale. 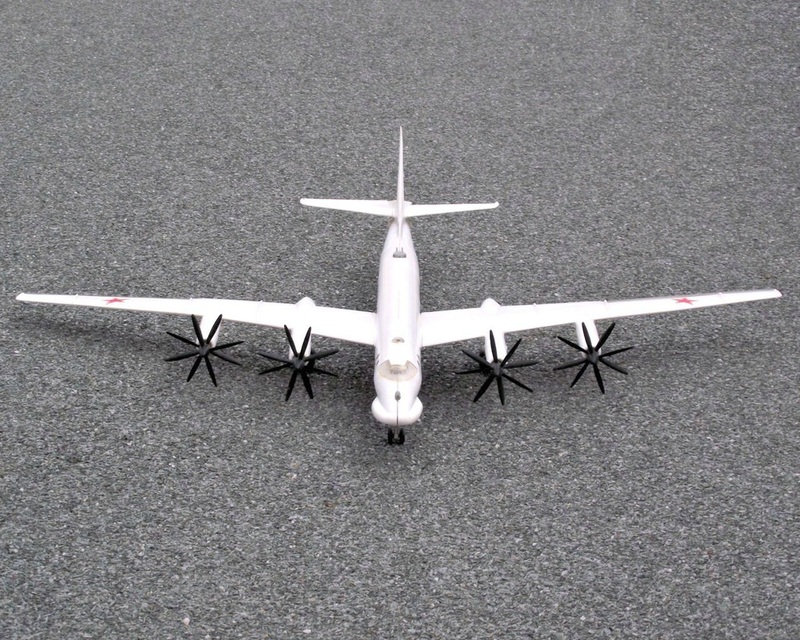 The main feature of the model, two contra-rotating propellers of four blades each, are functional if the model is correctly assembled. Parts are made of white, black and silver injection moulded plastic components. 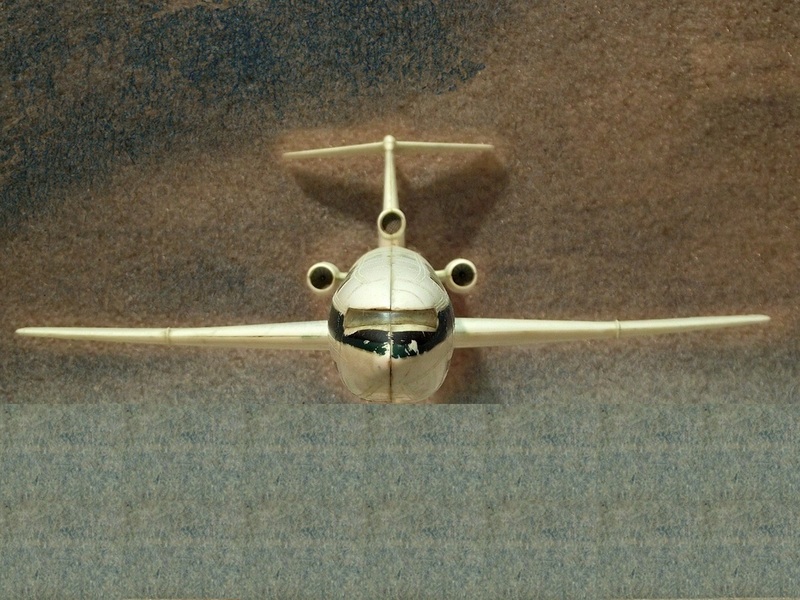 The pictures seen above were made in 2015 while the model was assembled somewhere around 1978-1979. 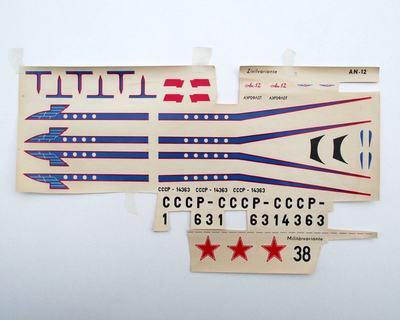 The only available decal was of course the Red Star, symbol of the former USSR military air force. I have to be careful with the preservation of this model as the real airplane is expected to serve Russian Air Force until at least 2040. This a 1:100 plastic scale model made between 1972-1988 by east German manufacturer VEB Kombinat PLASTICART Plastspielwaren. 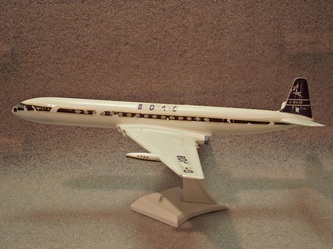 The pictured model was assembled in the late 70's. 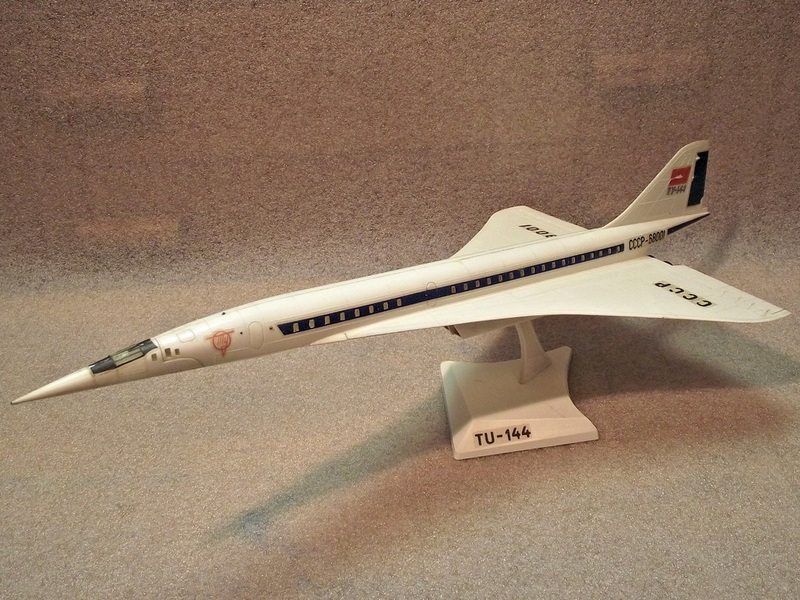 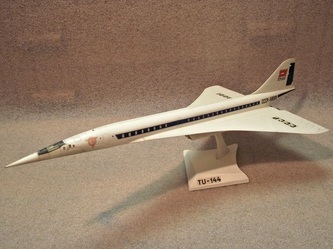 This model is the replica of the original TU-134 with glazed-nose. 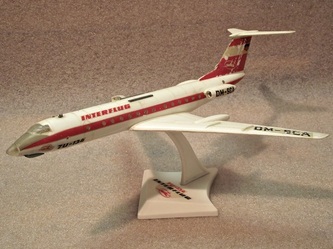 As it was operated by many countries but the decals for this model were for an INTERFLUG (former east German airlines) airliner. 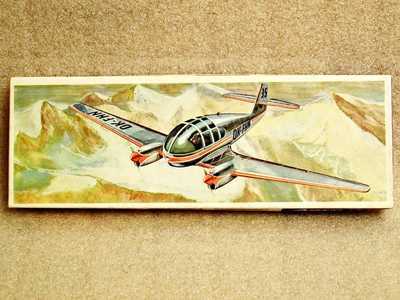 The painting presenting the aircraft at the airport was signed "REICH" as many other paintings from this series. 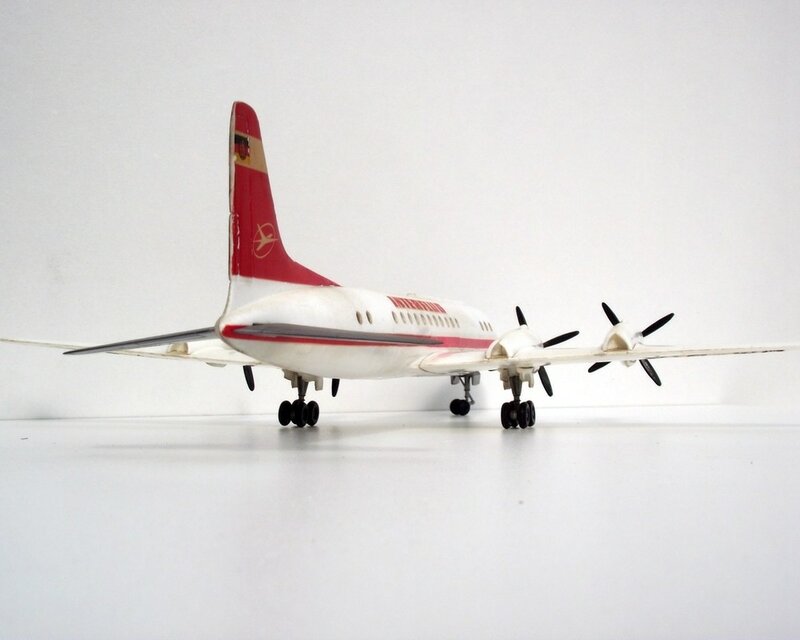 This 1:100 plastic scale model was made from 1969 by east German manufacturer VEB Kombinat PLASTICART Plastspielwaren. 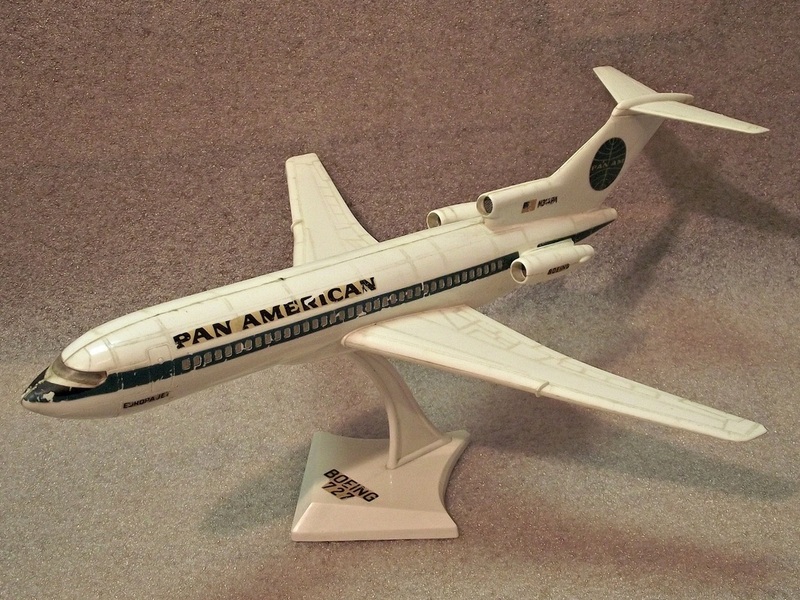 This scale model comes from the first series and was assembled in the late 7o's. 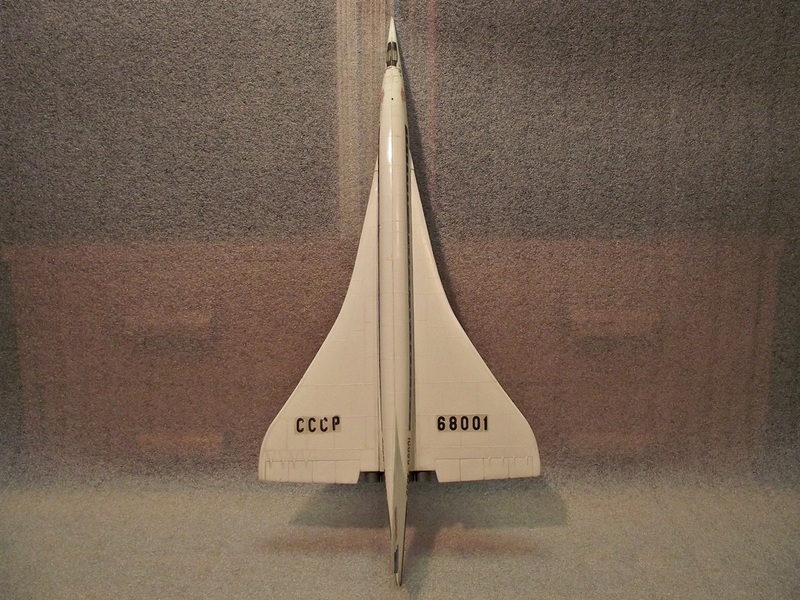 It is the replica of the first prototype made by Tupolev. 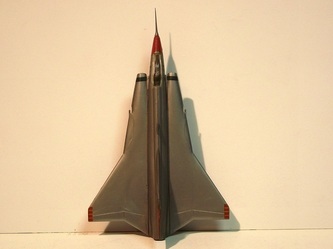 It does not have the later added two small retractable canard surfaces, one on either side of the forward section on the aircraft. 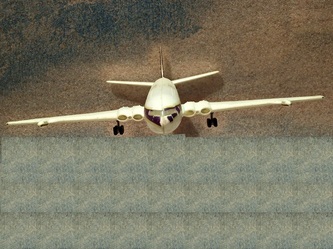 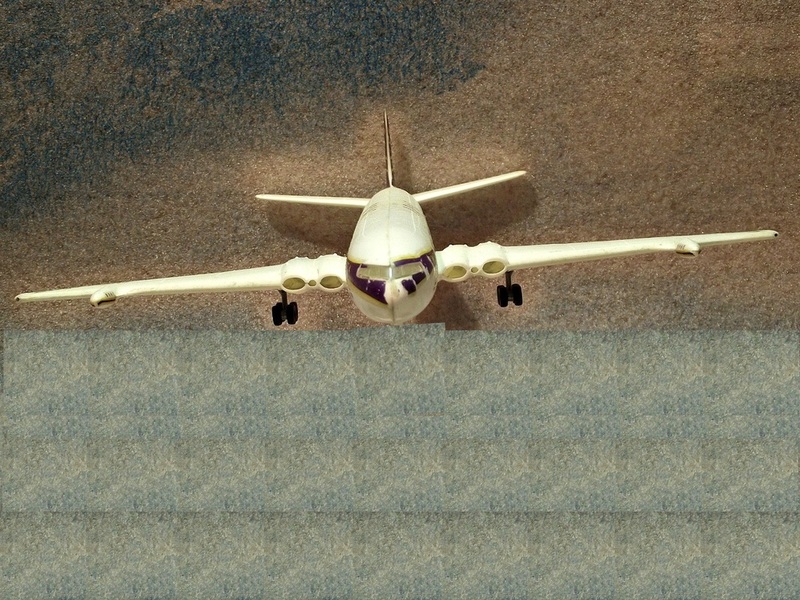 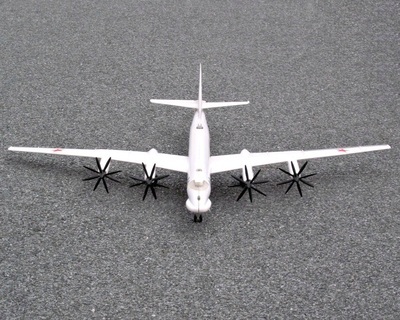 Also on this prototype the landing gear retracts into the wings while on the production models the gear retracts into a space between the air inlet ducts. 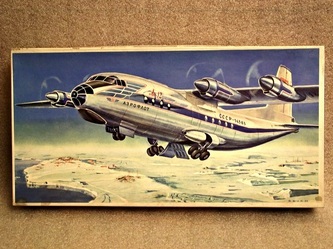 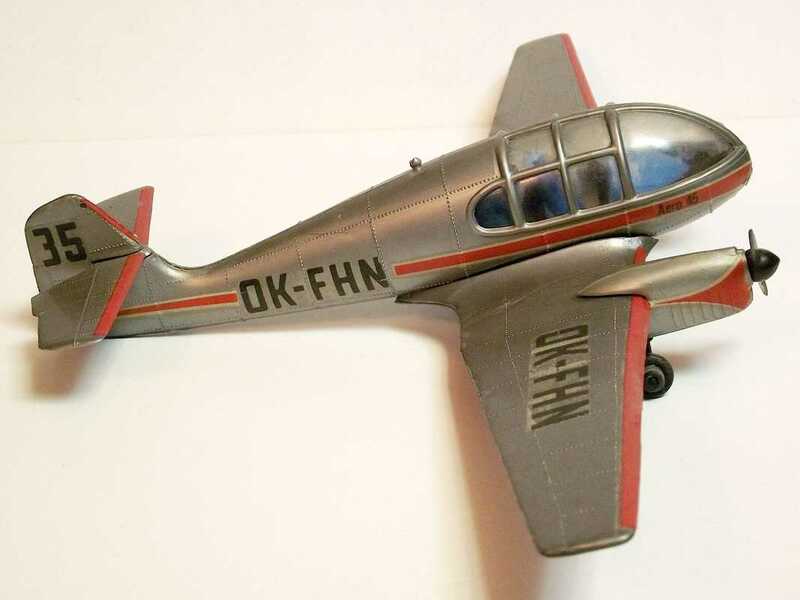 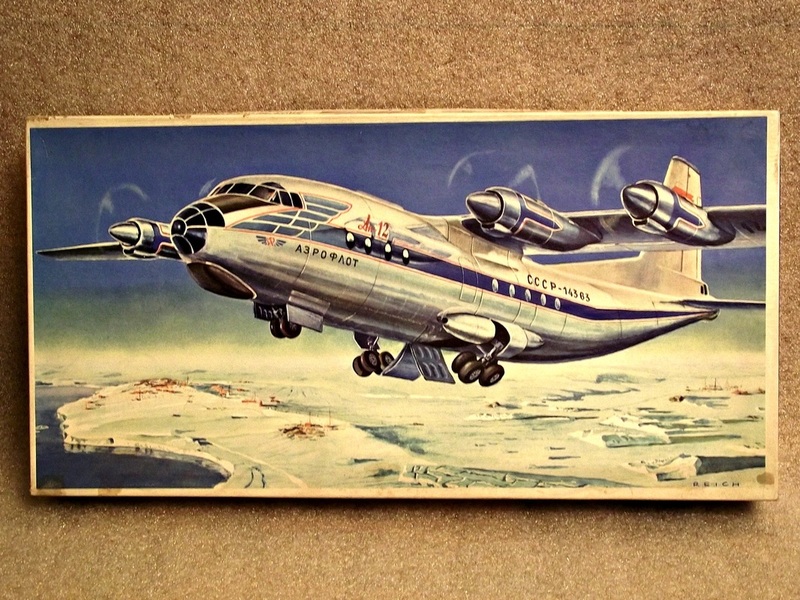 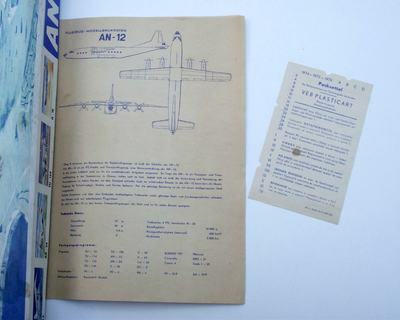 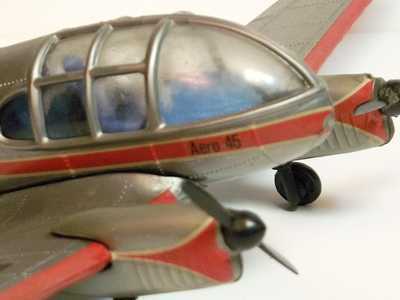 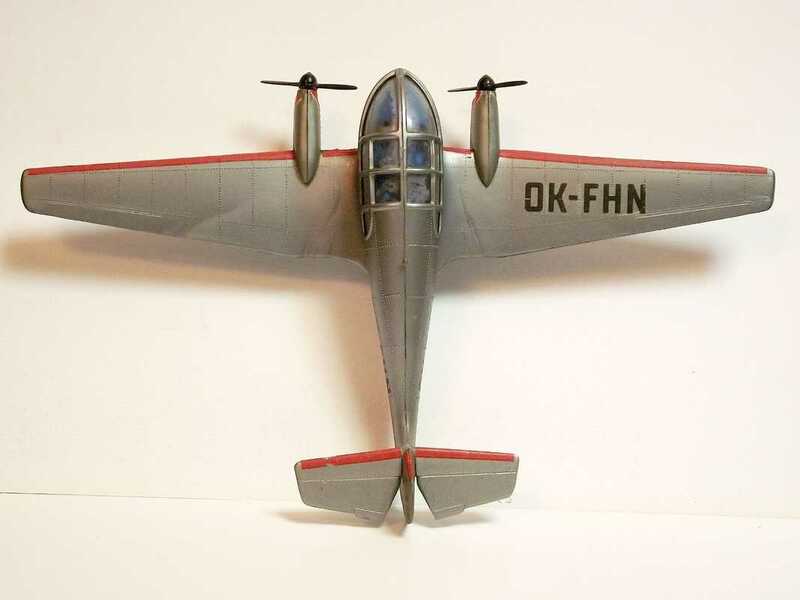 The model was presented with AEROFLOT ( аэрофлот) decals and the painting presenting the aircraft as taking off from an airfield was signed "REICH"
The Let L410 Turbolet is a twin engined short range transport aircraft, manufactured by the Czech aircraft manufacturer LET. 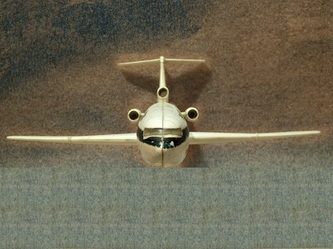 It is mostly used for passenger transport. 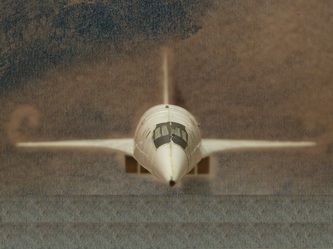 Since 1969 more than 1100 airframes have been produced. 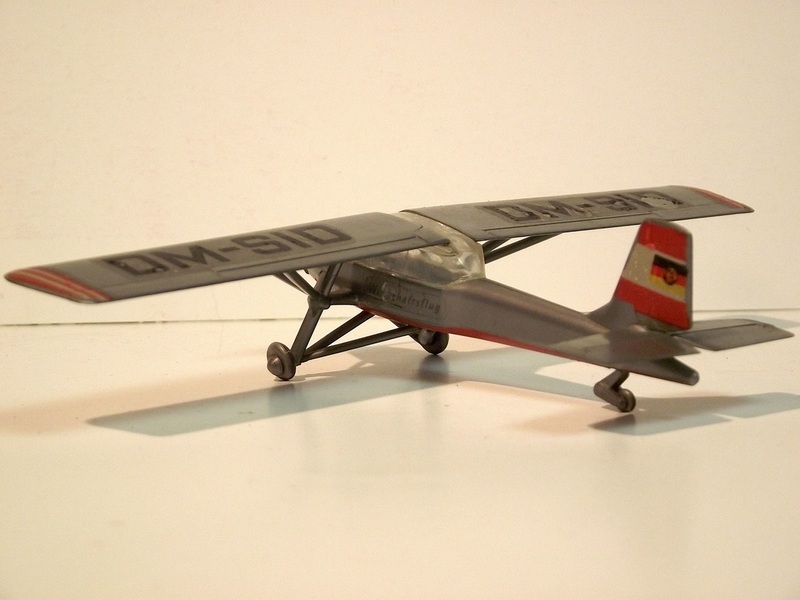 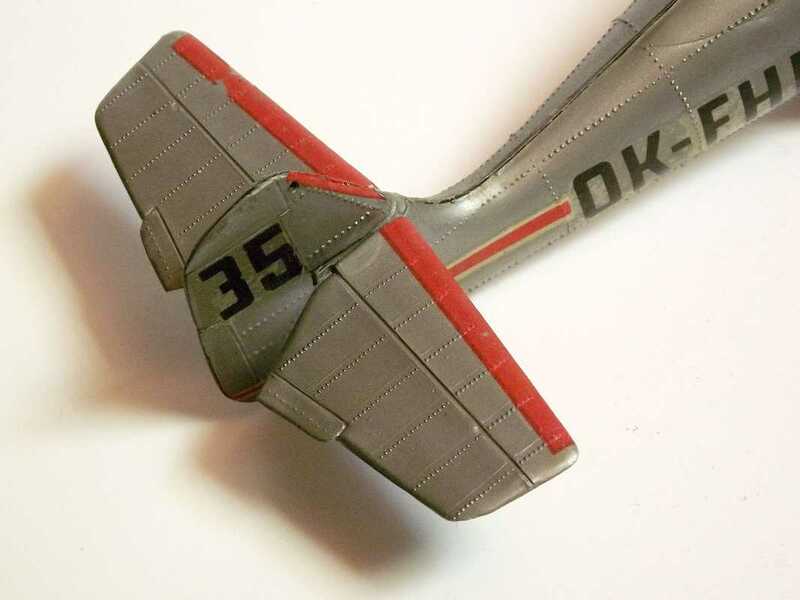 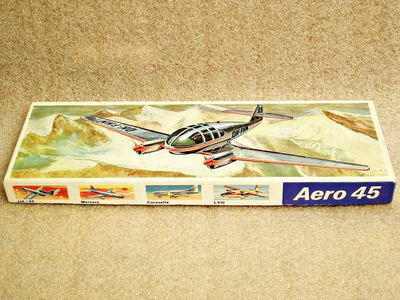 The pictured plastic airplane model kit was made in 1980 by east German manufacturer VEB Kombinat PLASTICART Plastspielwaren. 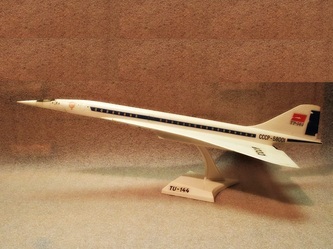 It is a 1:100 scale model. 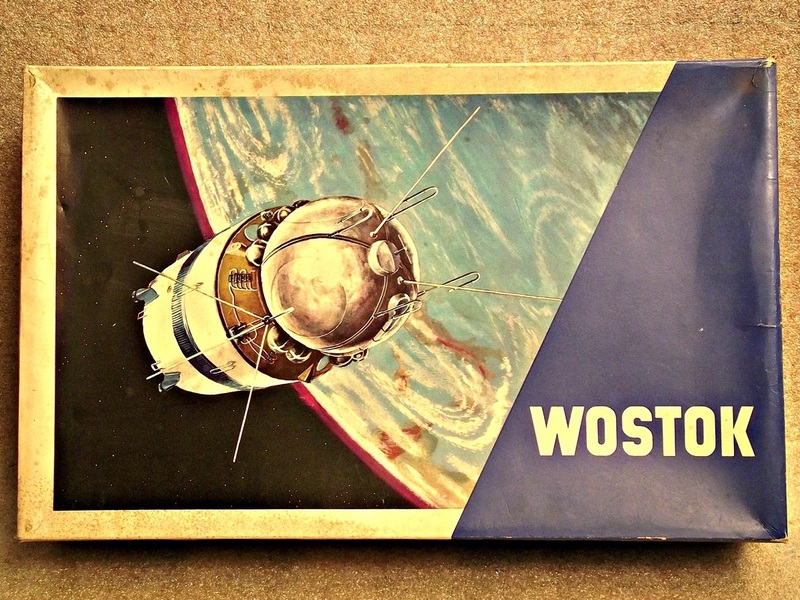 Wostok 1 (Russian: Восток-1, East 1 or Orient 1) was the first spaceflight in the Vostok program and the first human spaceflight in history. 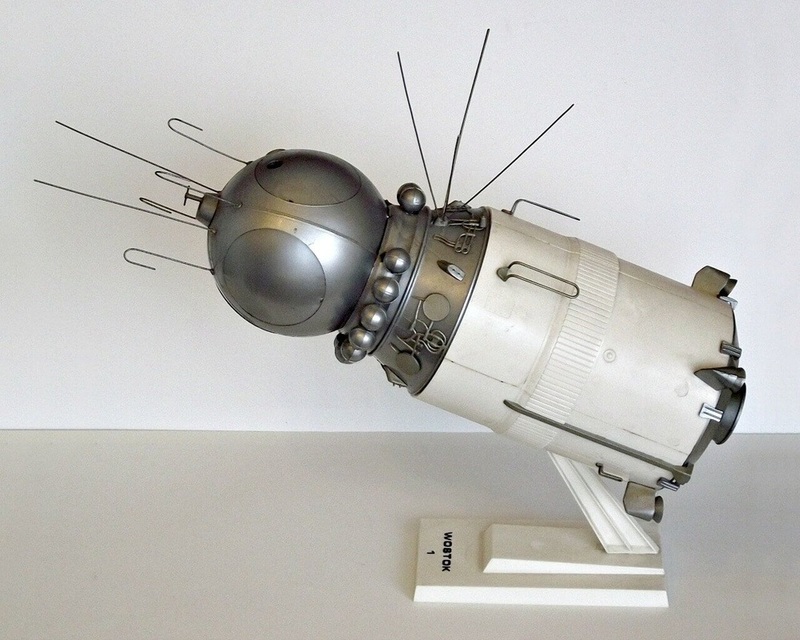 The Wostok 3KA spacecraft was launched on April 12, 1961. 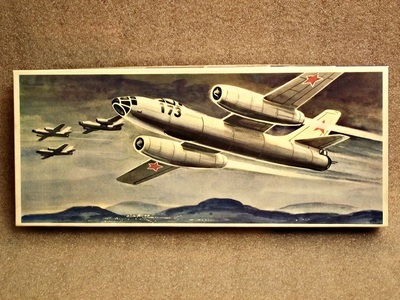 The flight took Yuri Gagarin into space as the first man in space. 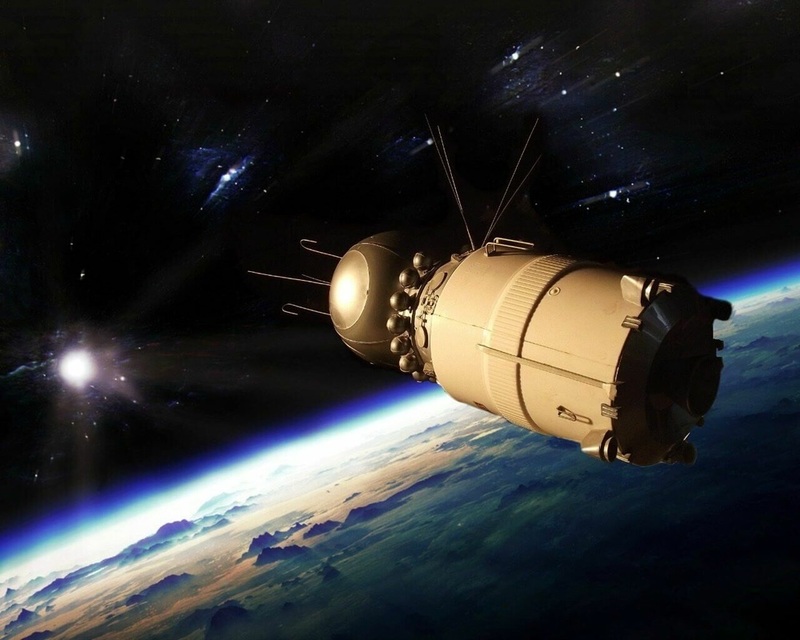 According to official records, the spaceflight took 108 minutes from launch to landing. 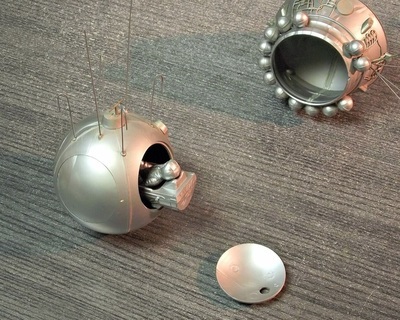 As planned, Gagarin landed separately from his spacecraft, having ejected with a parachute 7 km (23,000 ft) above ground. 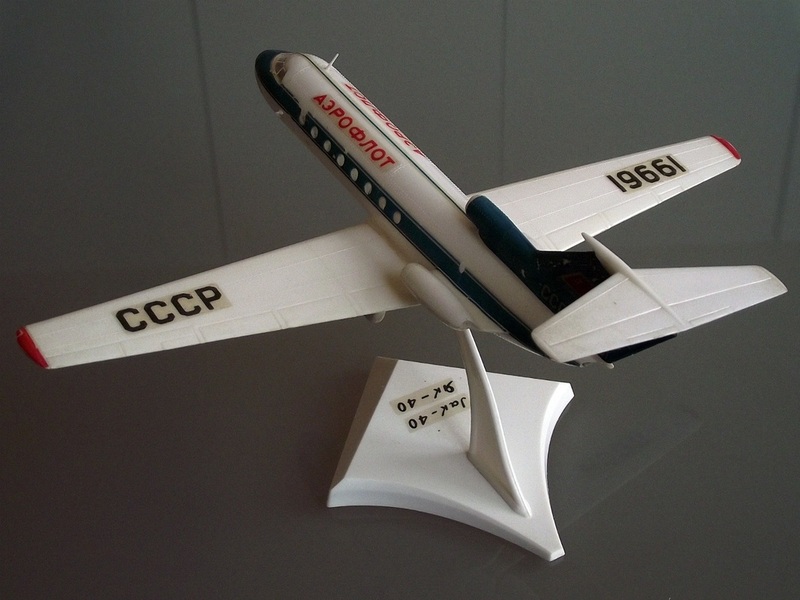 On 27 March 1968, while on a routine training flight from Chkalovsky Air Base, Yuri Gagarin and flight instructor Vladimir Seryogin died (aged 34) in a MiG-15UTI crash near the town of Kirzhach. 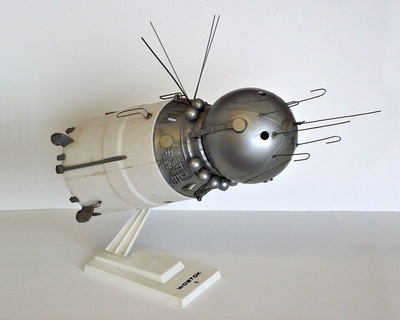 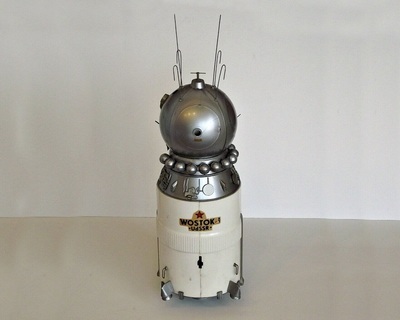 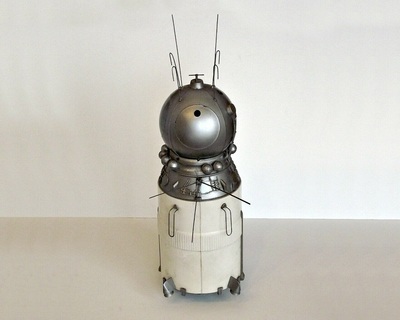 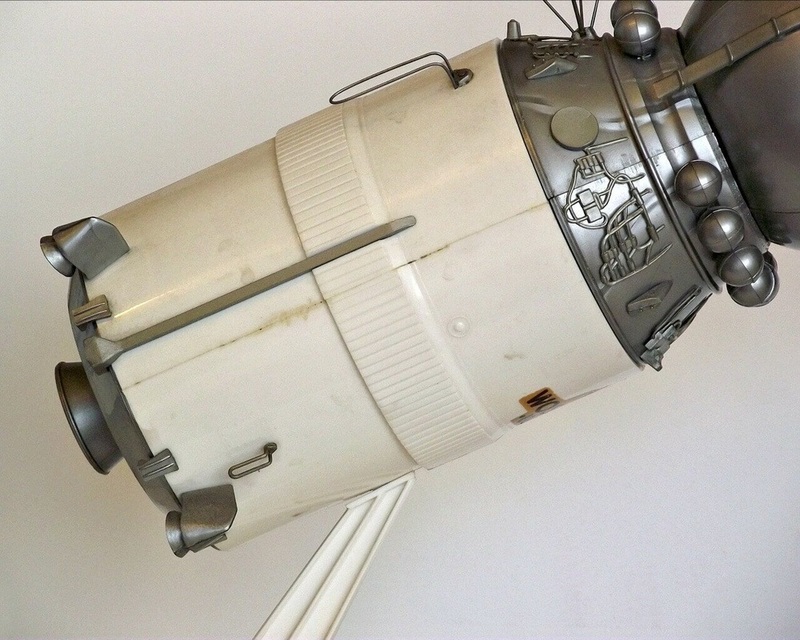 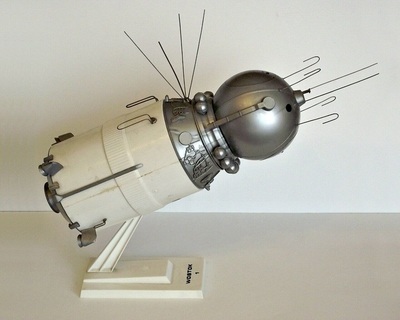 This is a 1:25 plastic scale model of the Soviet Wostok-1 (Восток-1) spacecraft. 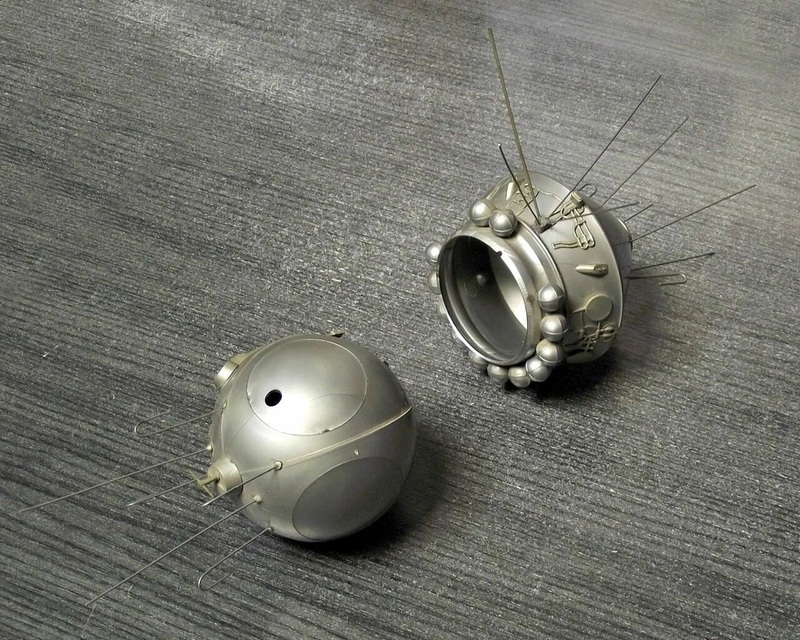 The scale model can be separated into 3 modules and they are held in place by a rubber band inside the spacecraft. 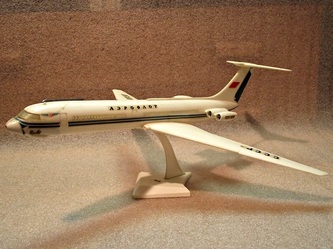 The model was assambled aproximately in 1971. The antennas are extremely fragile and most of them were broken so I replaced them (in 2016) with steel wire replicas. 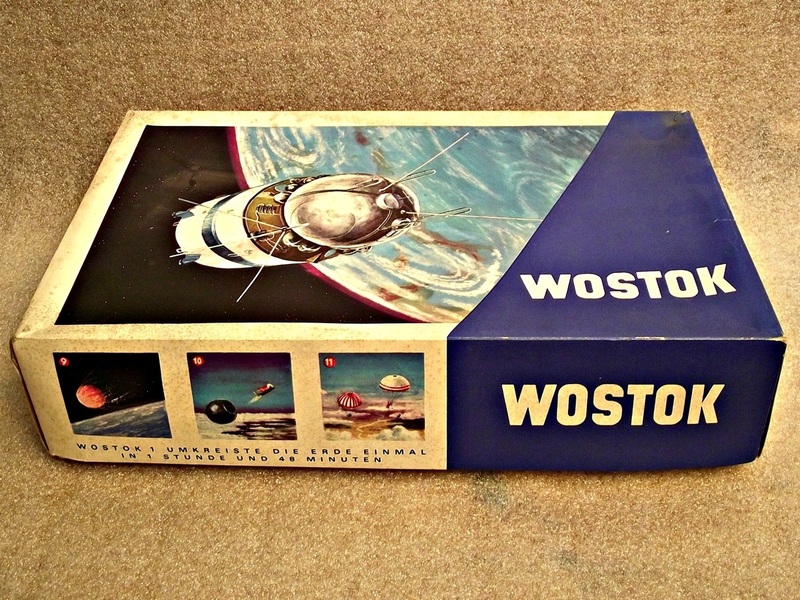 The first picture actually shows the VEB Plasticart Wostok-1 scale model.....in space.....in 2016. The Yakovlev YAK-40 is a small, three engined airliner that is often called the first regional jet transport aircraft. 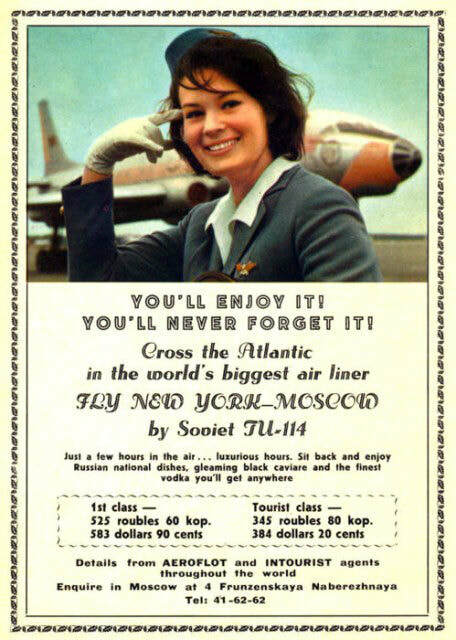 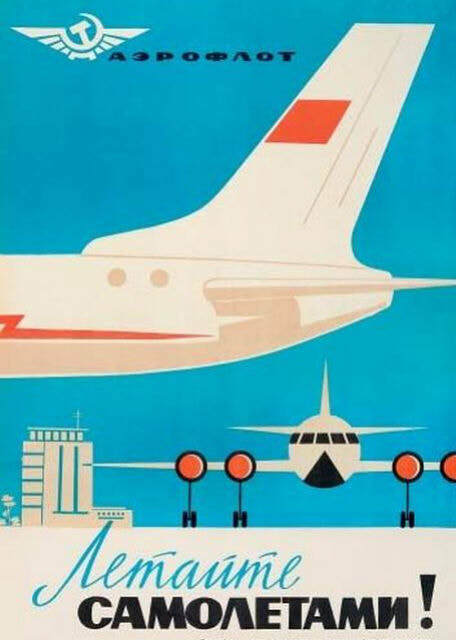 It was introduced in september 1968 with Aeroflot. It was produced between 1967 and 1981.